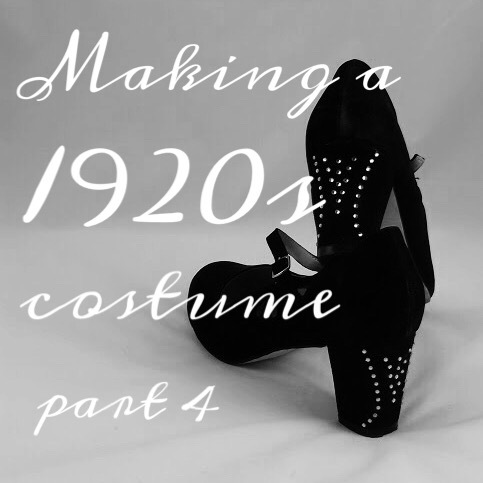 Welcome back for the final installment of making my 1920s costume! 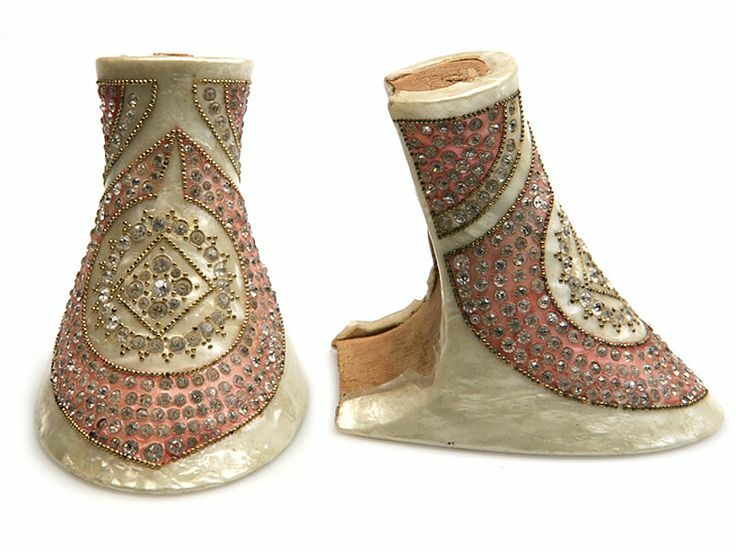 I am very excited to share details about preparing the last part of my ensemble – my shoes – and to reveal my costume in its entirety! 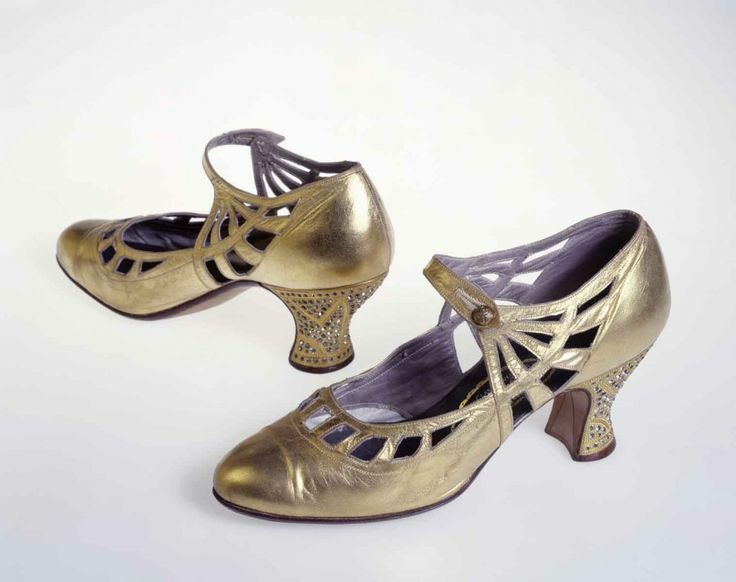 One of the easiest and most fun components of my roaring twenties costume was the shoes. 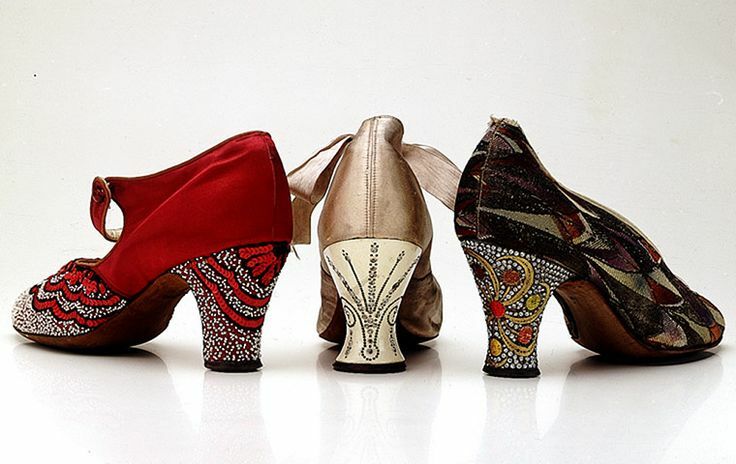 While the other components of my ensemble – my dress, headpiece, and purse – have a definite ‘costume’ feel to them, I knew I wanted my shoes to still translate into my regular wardrobe. 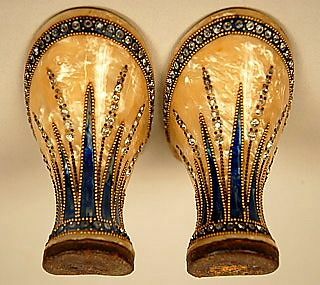 I began researching 1920s evening shoes and found some amazing inspiration! 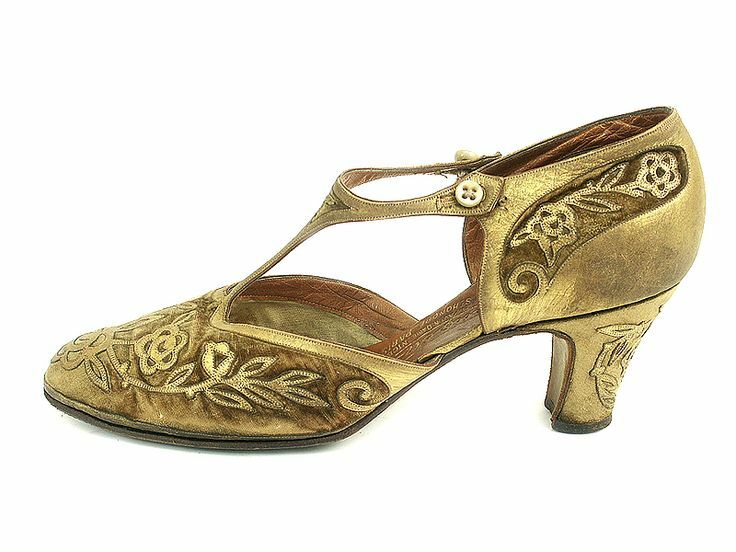 The 1920s were an interesting time for women’s footwear, because hemlines were suddenly short enough that shoes were always visible. 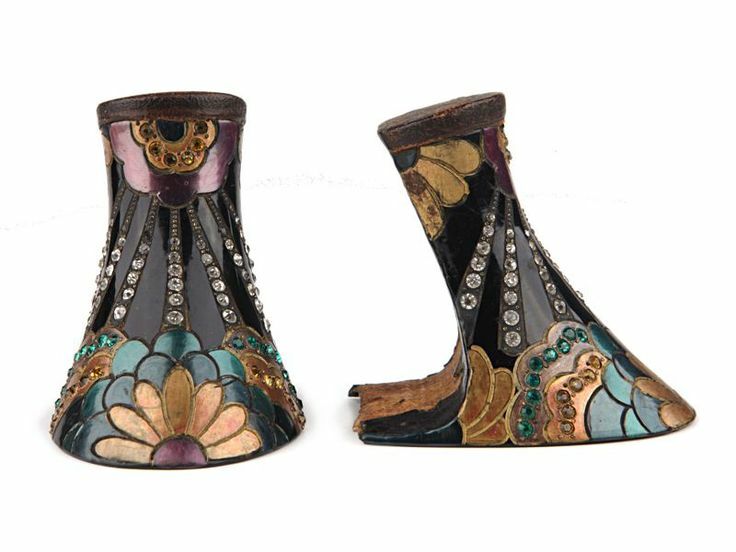 As a result, every component of a shoe was fair game for embellishment, including the heel! 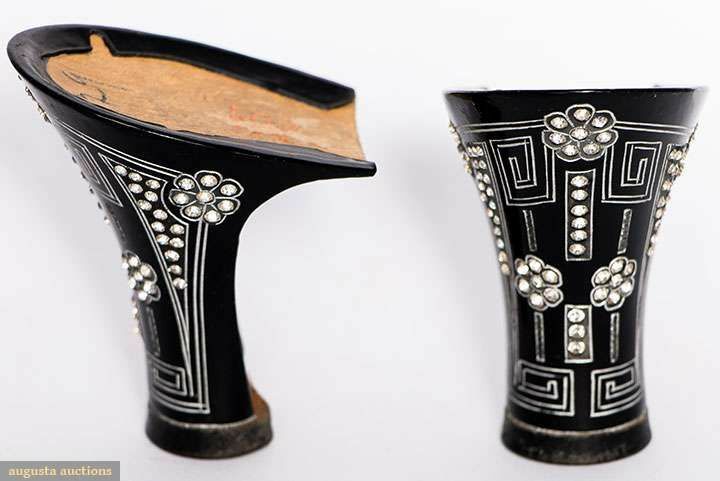 After drooling over all the incredible designs, I knew I wanted to add rhinestones to my heels! 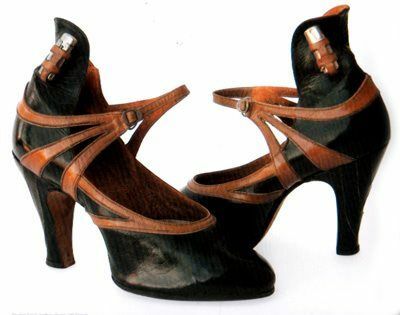 I searched for the right pair of shoes: something with a modest heel of an appropriate shape (the heel needed to be 2.5” or less and not too conical) and a Mary Jane or T-strap. 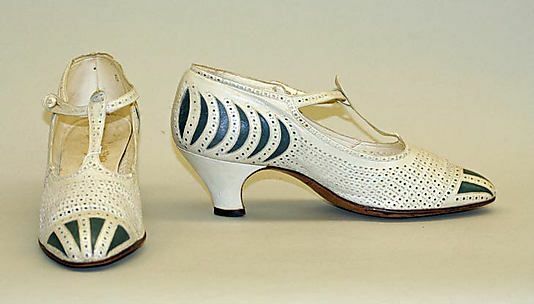 Luckily for me, vintage-influenced styles are produced every season, so I knew it wouldn’t be impossible to find a good pair of shoes that met these criteria. 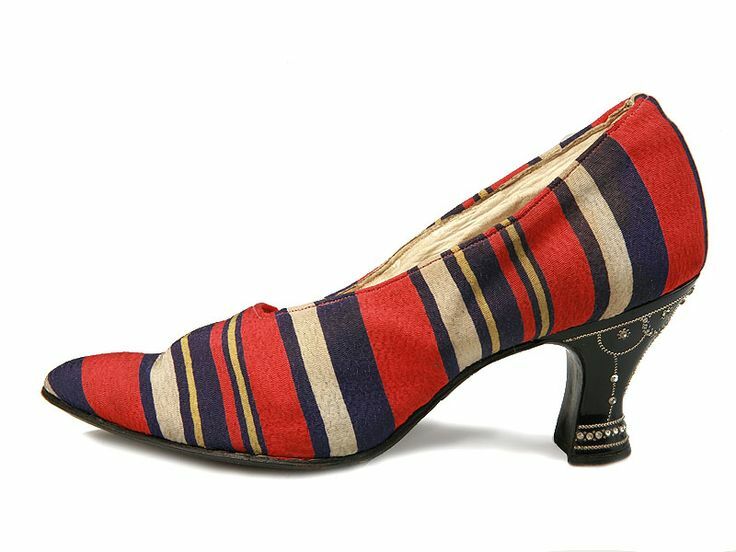 I found several pairs of shoes that were really fun, in bright colors like tangerine and citron, or with spectator styling. Unfortunately, these were either too tall or out of my price range, so I kept looking. 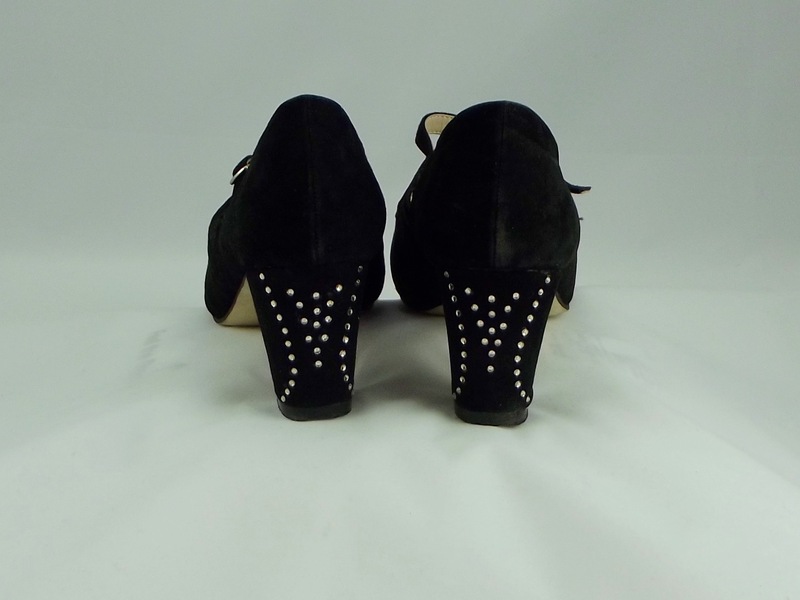 I’m so glad I did, because I found just the right pair of shoes! 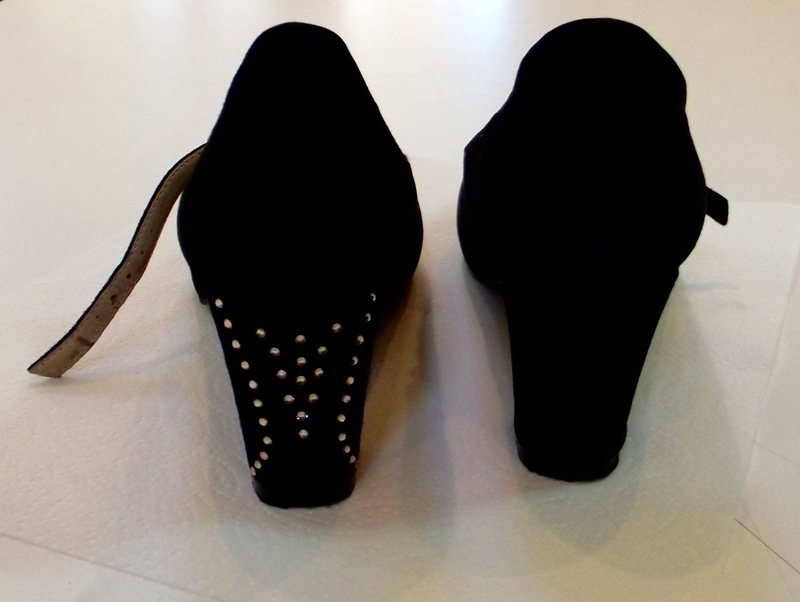 Once I had the shoes in hand, I planned out a simple-but-effective design for rhinestones on my heels. 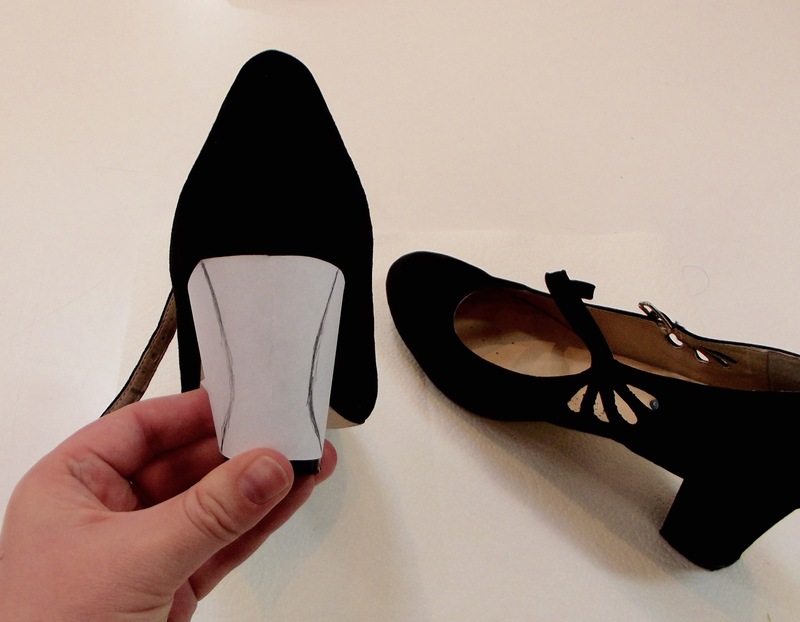 I began by making a template of my heel using white printer paper. I sketched an outline, inspired by the shape of actual twenties heels. 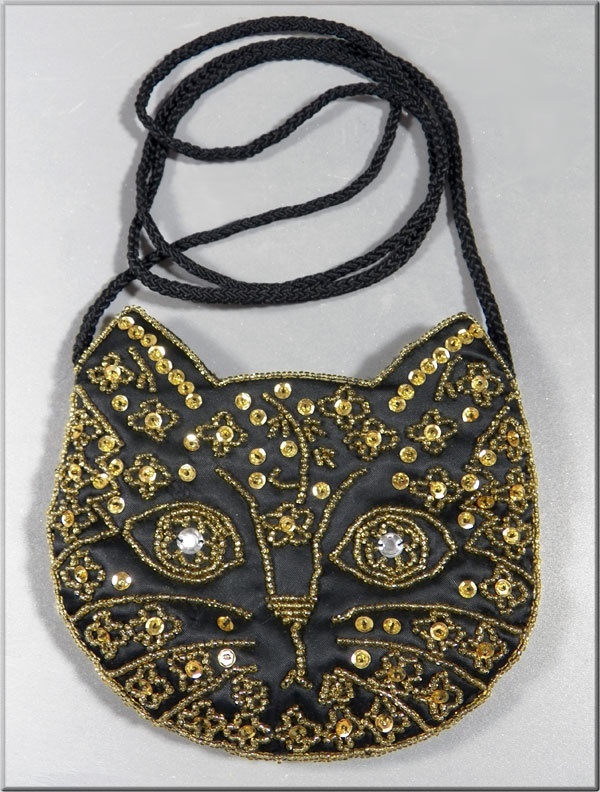 From there I created my motif and marked rhinestone placement. 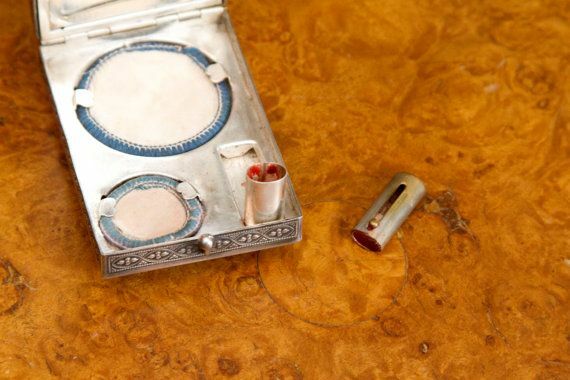 I made holes in my template using an awl (a very thick needle, like a tapestry needle, would also work for this) and marked where my rhinestones should go using a white colored pencil. …and repeated on the second! I totally love how they turned out! Now that that’s out of the way, let’s move on the final reveal! I feel like this costume really needs a sound track! 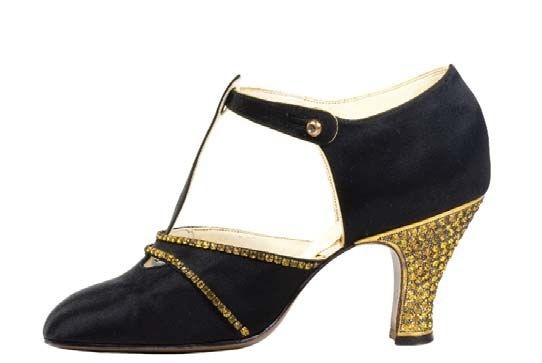 Let’s enjoy the Charleston! I love the view from the back, showing off the jaunty neck scarf and flashing my new heels. Thanks so much for joining me through this whole process! It was incredibly fun to dream up and make this costume, and even better to share it! If you have any feedback, questions, or ideas for what you’d like to see in the future, let me know in the comments below! 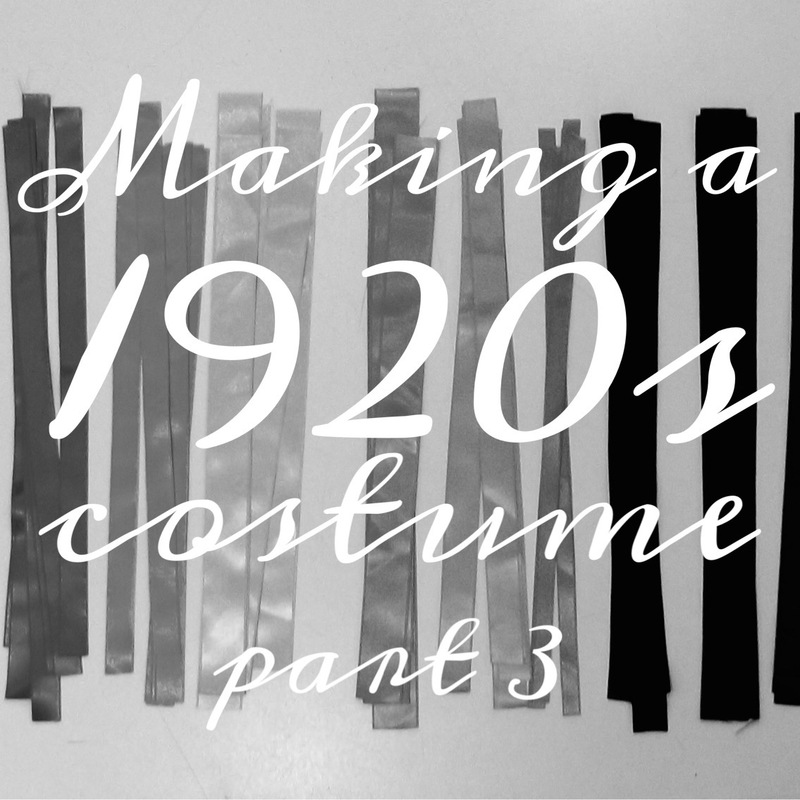 I am so excited to share the third installment of making my 1920s costume; this week, I’m making a purse! I have plenty of lovely inspiration to share, along with a really neat tutorial. Let’s get started! 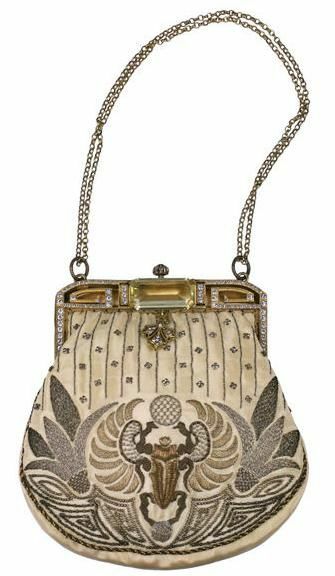 As with my dress and my headpiece, I began by researching twenties purse styles with a focus on evening bags. 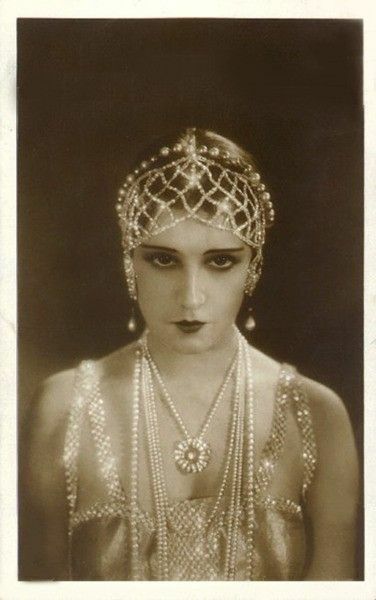 One of the best parts of 1920s garments and accessories for evening wear is the detailing: beading! 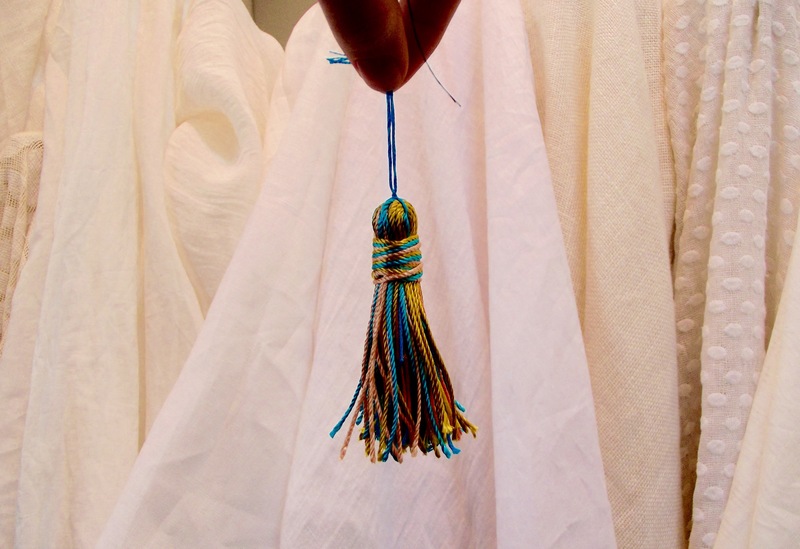 tassels! fringe! rhinestones! And the list goes on and on! 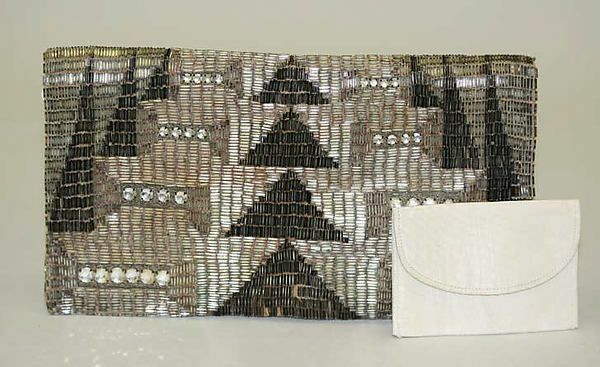 One of my favorite styles to come across was the compact purse: a small substitute for an evening bag, created to carry only the necessities of make-up, lipstick, and maybe a little money. 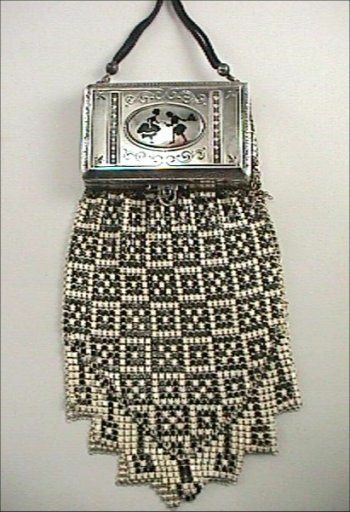 The more standard styles of evening bag, whether a clutch or reticule, with a drawstring or a kisslock closure, had a bit more room for personal articles. There was also an interesting hybrid that includes a compact as part of the bag frame. 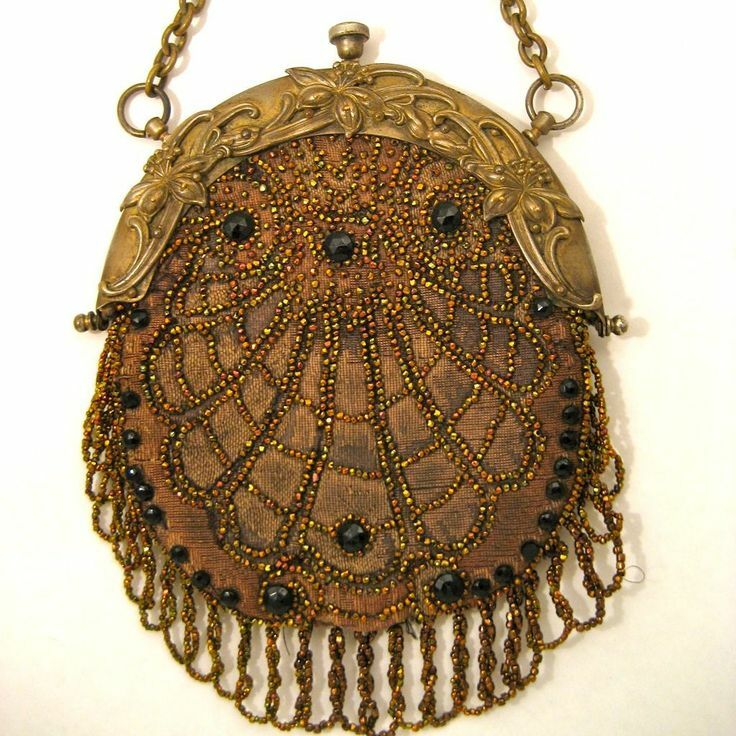 After finding so many amazing examples, I decided to do a search for actual vintage purse patterns. 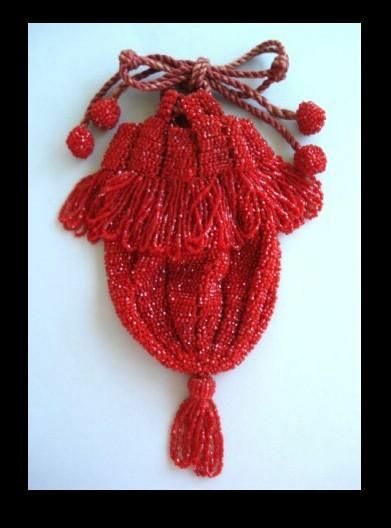 In a perfect universe, I would have made a hand-beaded purse, complete with beaded tassels or fringe. However, in reality, I knew I wouldn’t have the time to bead anything. I checked ebay and Etsy for patterns, without finding much. 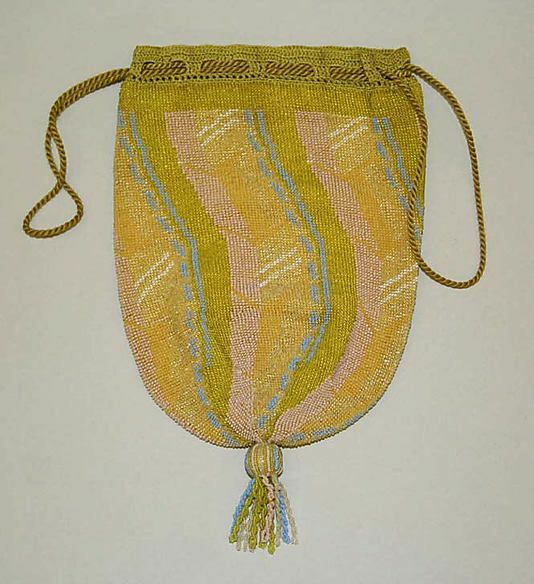 One of the Folkwear patterns I had considered for my dress included a pattern for a simple drawstring-style bag, but it wasn’t exactly my preferred shape. But then I found the best possible inspiration: a vintage instructional video from the 1920s in how to make a ‘dainty handbag’! I find this video particularly charming because they skip so many of the steps in the actual creation of the purse! It was clearly made during a time when most people were practiced enough in sewing that they could easily fill in the gaps. 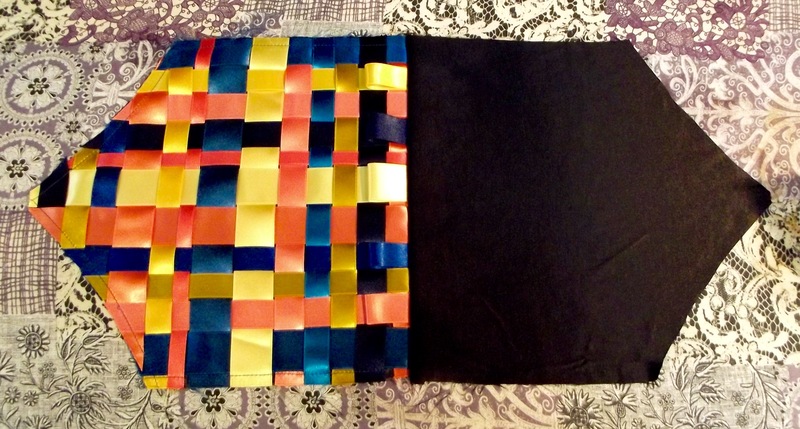 To a modern viewer, the use of crepe paper may seem absurd, but I was totally inspired by the concept of weaving fabric out of something colorful and flat. What if I were to update this idea by using something that is longer lasting, like ribbon? I decided to try it out! 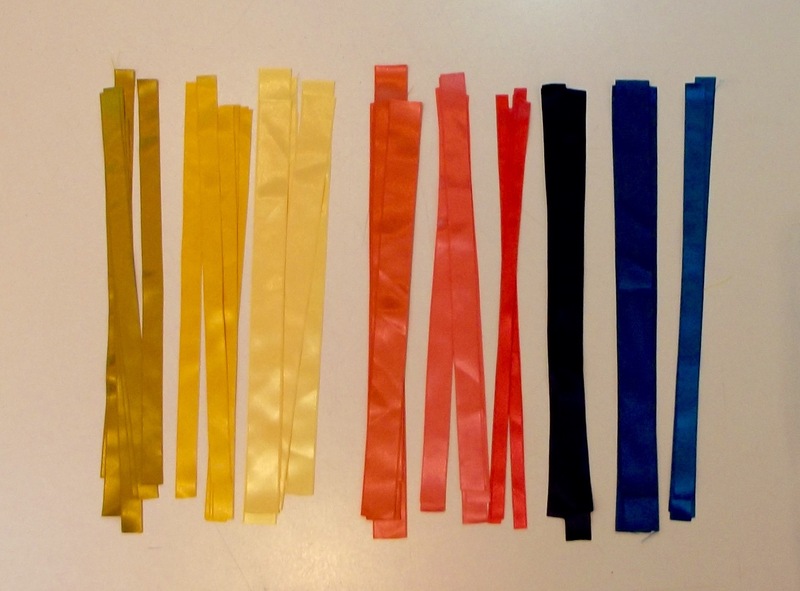 I collected double-face polyester satin ribbons in a color palette to coordinate with my dress, pulling three shades each of blue, coral, and yellow. 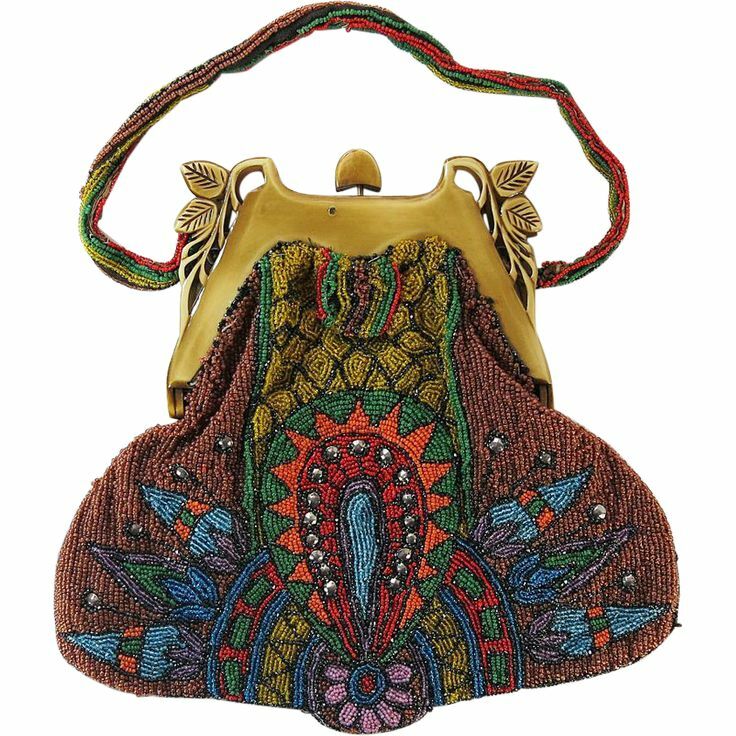 Inspired by the silhouettes and details of a few of my favorite vintage purses, I decided to make a reticule with a drawstring, with a tassel hanging off the bottom. Following the vintage tutorial, I wove my ribbons together and then sewed them into a purse! I am so happy with the results. 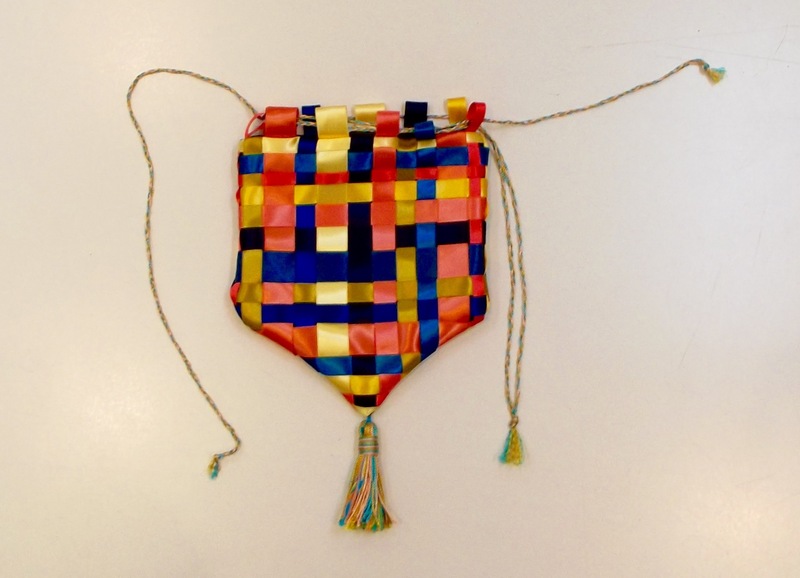 Are you interested in making a 1920s style purse of your very own? Follow the tutorial below! 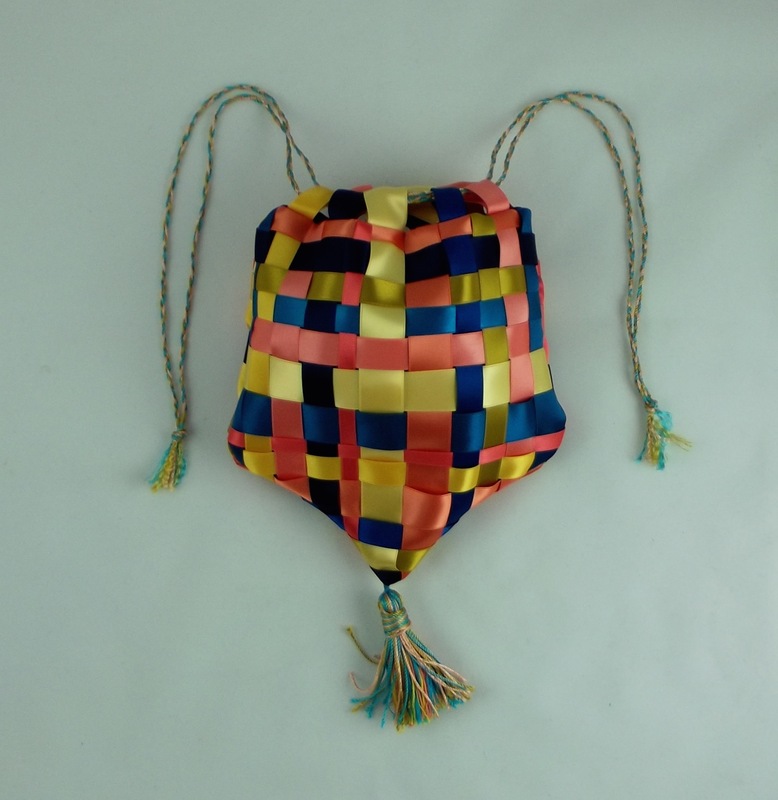 When I go out, I like to have enough space in my handbag for my keys, lipstick, cell phone, and a small wallet for ID and money, but I didn’t want this purse to be too cumbersome. 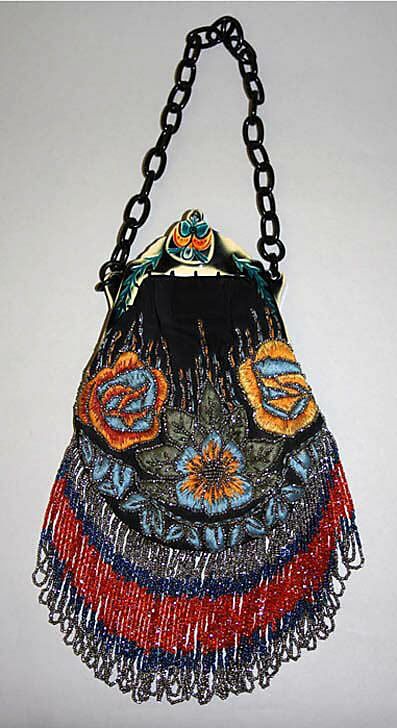 My finished purse measures approximately 8” wide by 9” tall, not including handles or tassel. Ribbon: enough to weave two 12” x 12” squares, plus additional length to create loops for the handles. This requires a bit of math. I used 2yds each of 9 ribbons in different colors and widths (I wanted an uneven, dynamic effect to the fabric I wove). Use only one width of ribbon in one or two colors for a subtler look, or use different widths to create a graphic motif (this dress is made of woven ribbons!). If you use only 1” wide ribbon, you will need at least 16yds of ribbon. 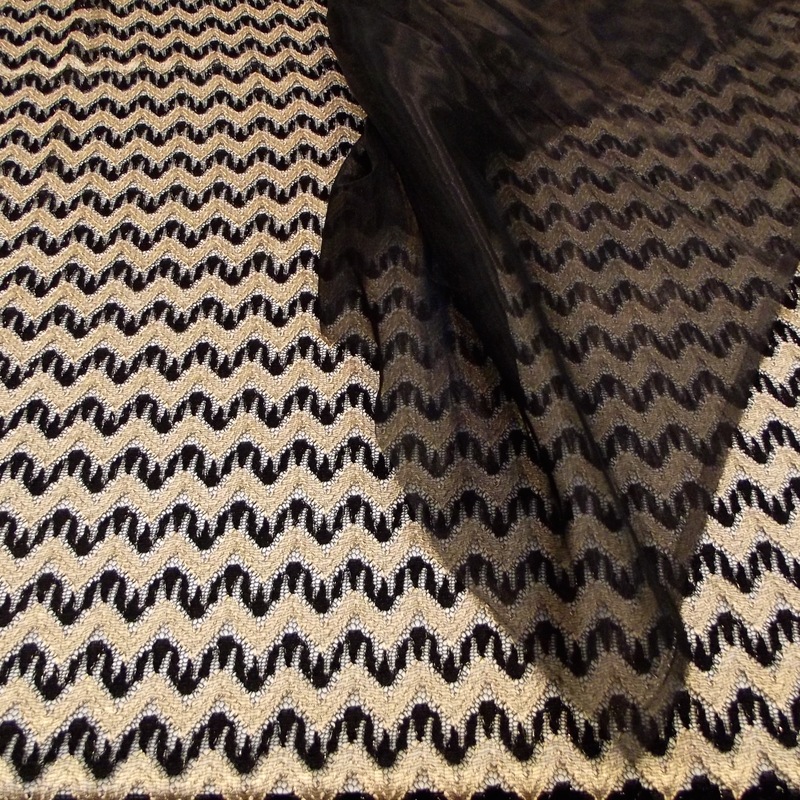 NOTE: I used double-face ribbon for this project, which increases the ease of weaving, but is not requisite. 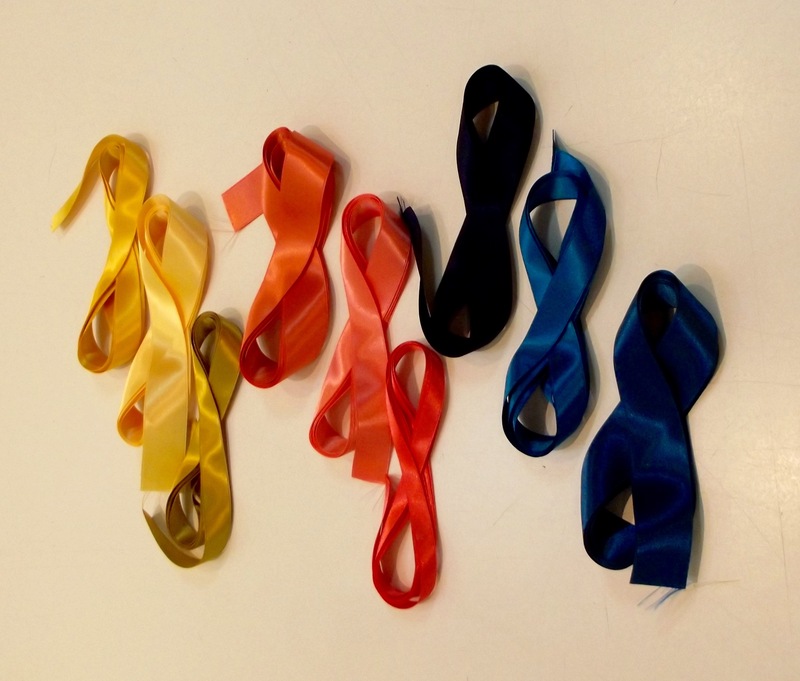 If you select a single face ribbon, you will just need to be more diligent during step 3. 1. Cut ribbons into 12” lengths. 2. Make paper pattern. 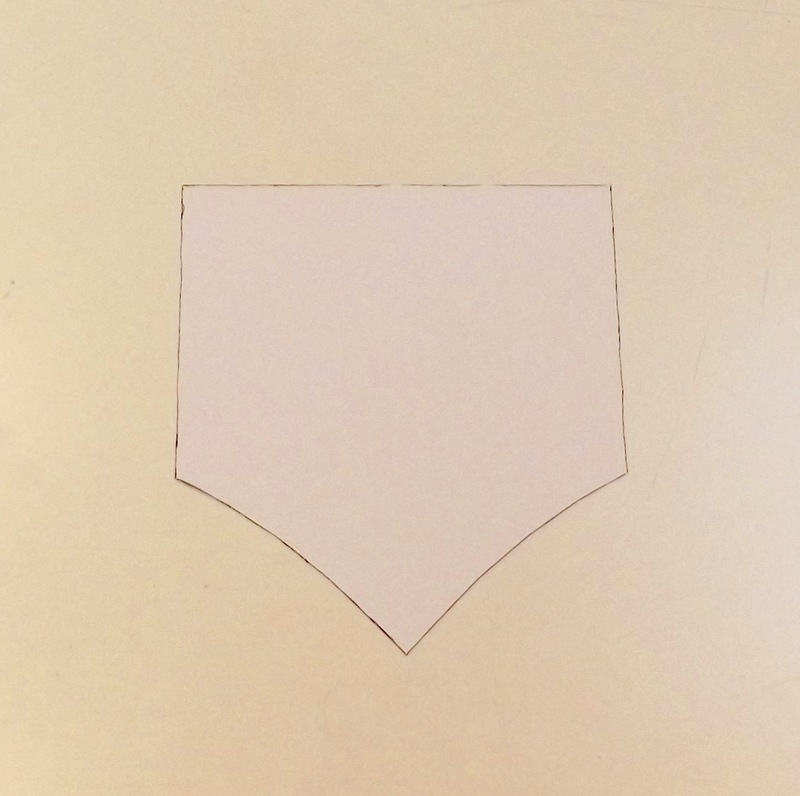 Using the full width of my paper, I drew an approximate shape for the purse bottom and cut it out. 3. 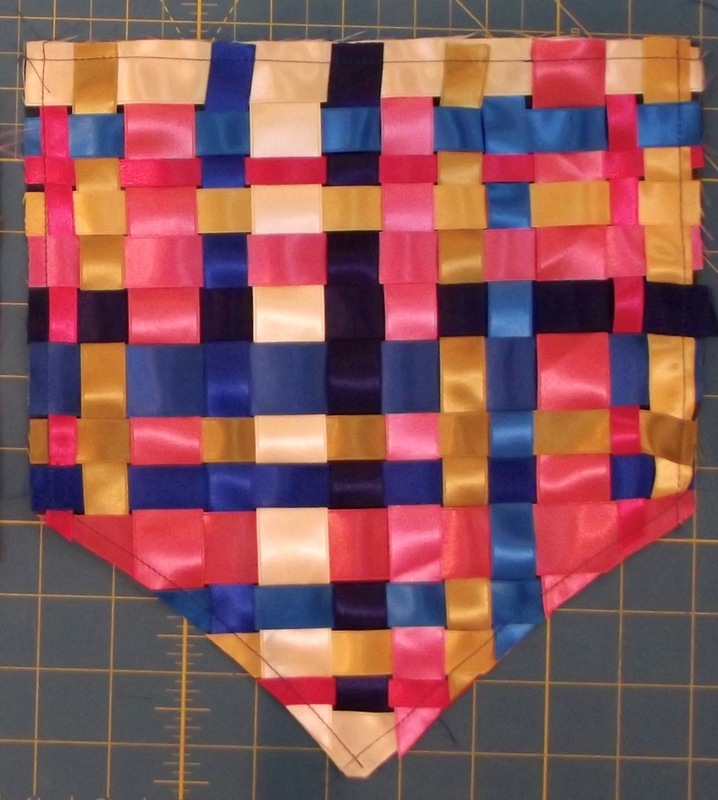 Weave ribbons into two 12” x 12” squares. I started on a gridded mat by lining up my ribbons along a gridline so they are parallel to one another, then taping down along one edge. Once my ‘warp’ ribbons are in place, I began weaving in my ‘weft’ ribbons, keeping the weave as tight as possible. 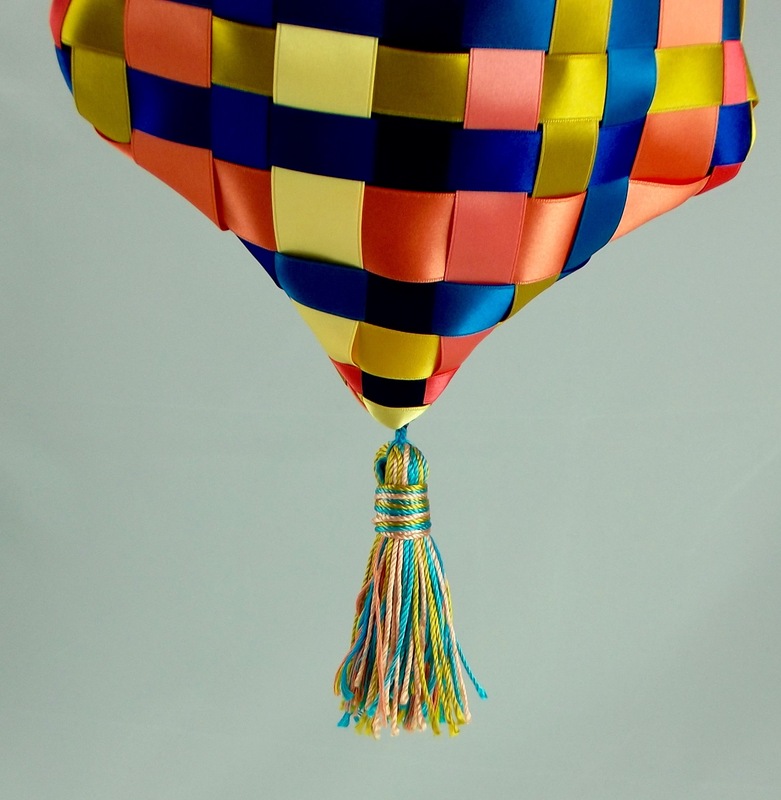 IMPORTANT: If you do not use double-face ribbon, you will need to weave your ribbons face down. 4. Once a 12” x 12” square is completed, follow the instructions on your spray baste to prepare one side of an underlining fabric square. 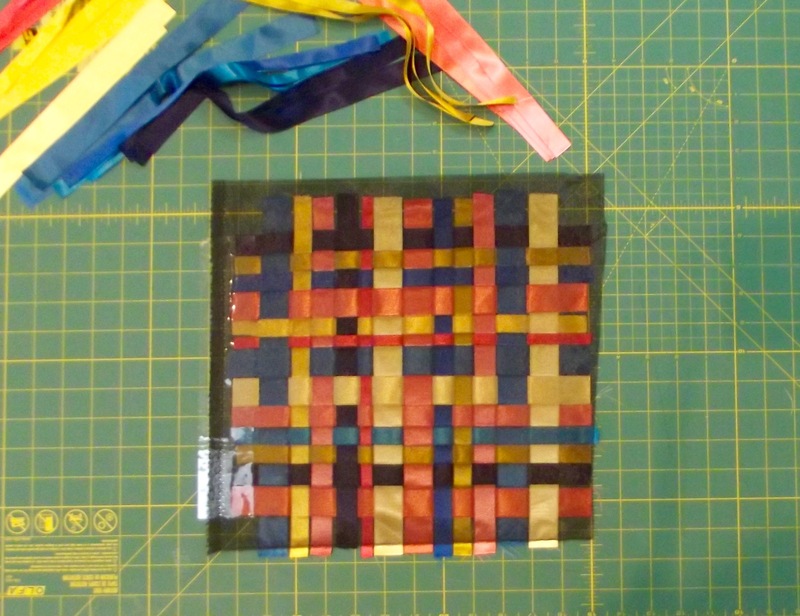 Place the sticky side of the underlining square on your woven ribbons; press in place. 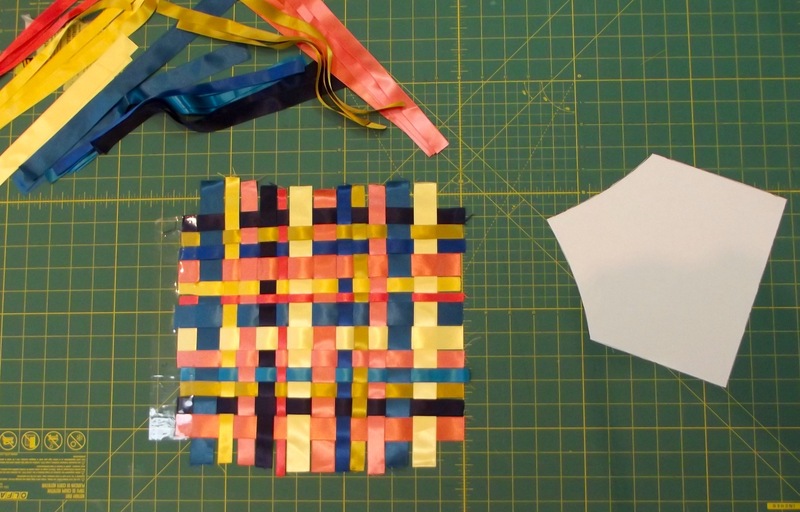 Repeat steps 3 & 4 to make a second woven ribbon square with underlining. 5. Cut out your purse bodies. I added a ½” seam allowance around my paper pattern piece using a Chaco-liner and small ruler. Repeat this step with lining fabric. 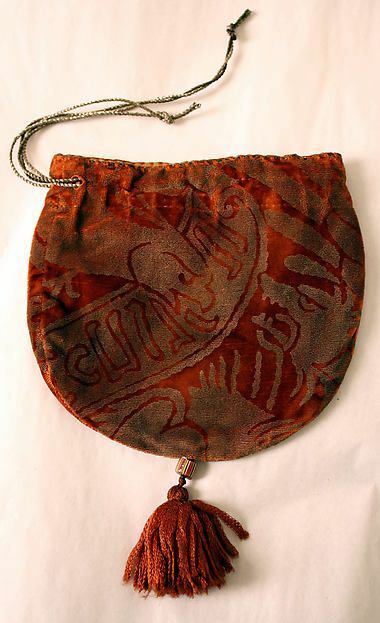 NOTE: for this particular design, I made my lining exactly the same shape as my purse. If I were to make this purse shape again, I would actually change the lining shape so it does not come to the same point at the bottom. I believe this would allow the lining to better sit down inside the purse. 6. To help keep the woven ribbons intact, machine baste around edges within seam allowance, ensuring the ribbons don’t shift out of place. 7. 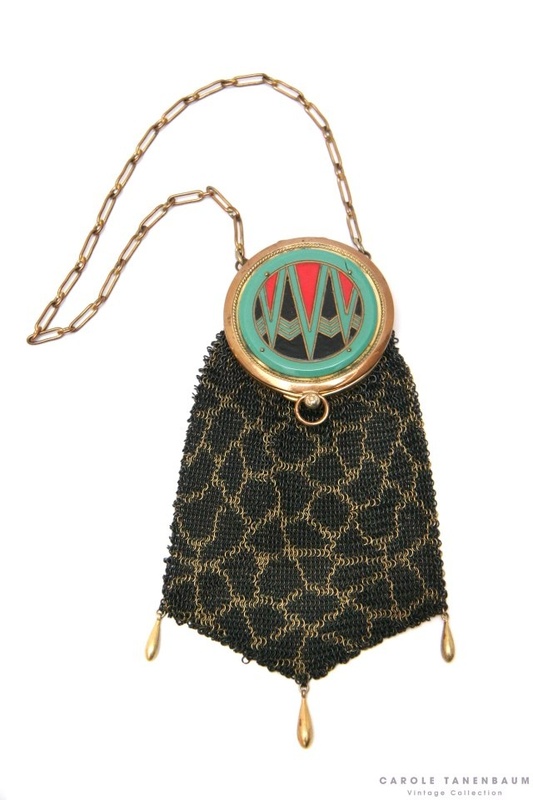 Determine where you would like your ribbon loops to go at purse top. 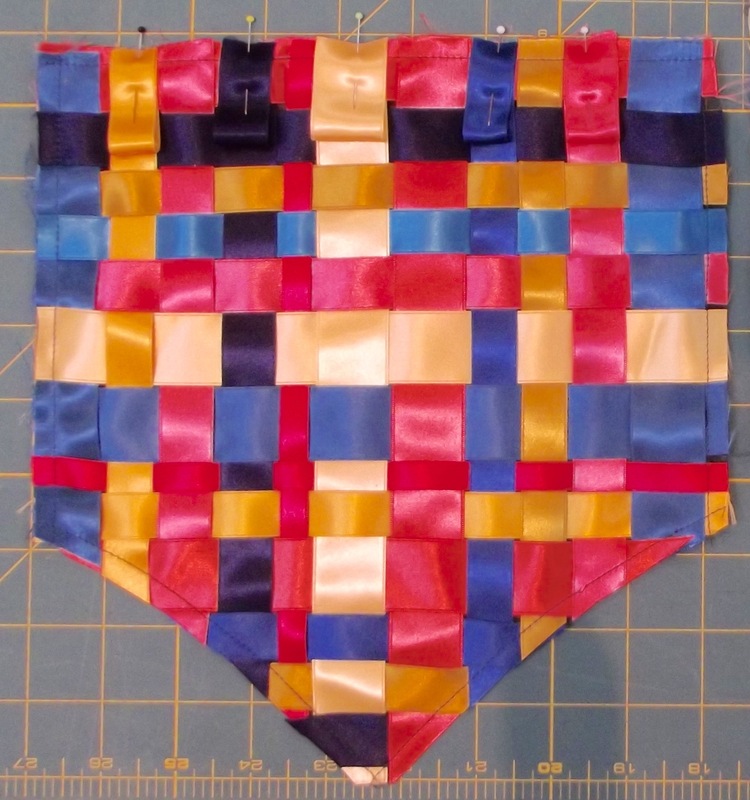 I chose to make it look like the ribbons are extending up as part of the woven effect; because my ribbon colors and widths were all different, my loops reflected this. 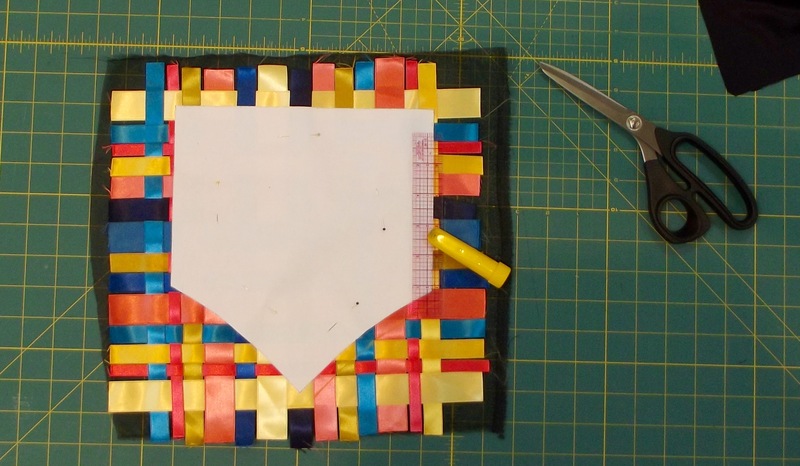 Use 3” cuts of ribbon to make loops: fold ribbon in half, pin in place matching raw edges of ribbon to purse top. 8. 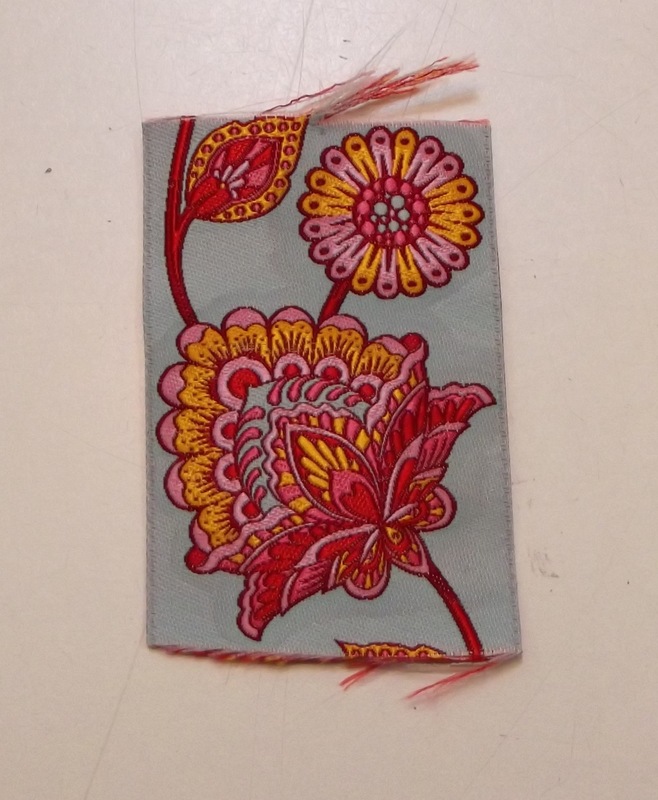 Lay one purse lining piece over purse front, right sides together, aligning top edges. Sew purse lining to purse front along top edge. 9. 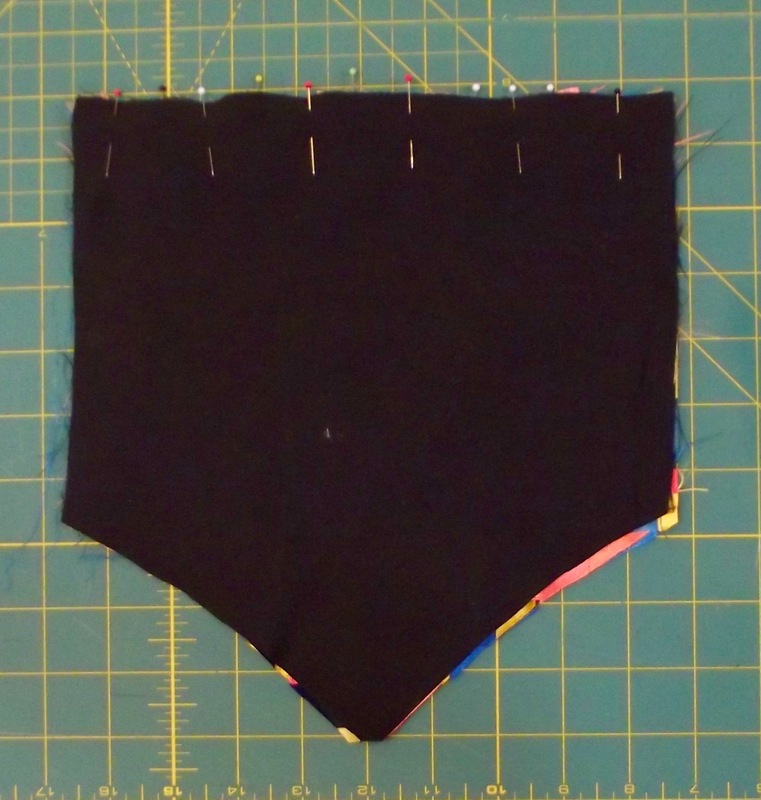 Press open, with seam allowance toward lining. Repeat steps 7 through 9 for second purse front and lining piece. 10. 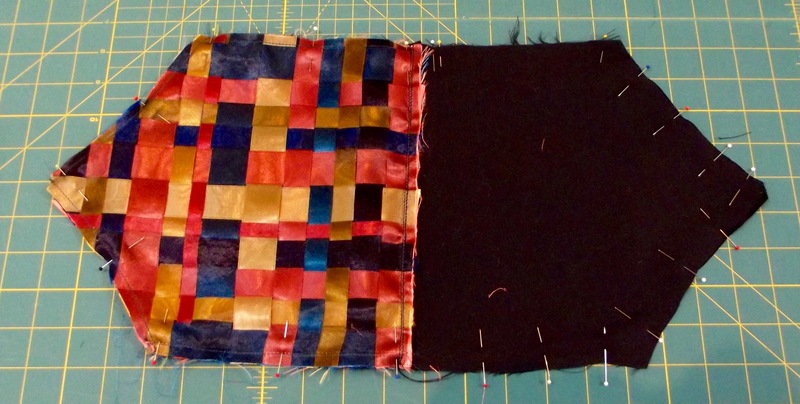 With right sides together, pin the purse front/lining pieces together. Sew together leaving an opening in lining for turning. Notice the marked opening at the bottom left for turning. 11. Turn right side out and sew opening closed, either by machine or hand. 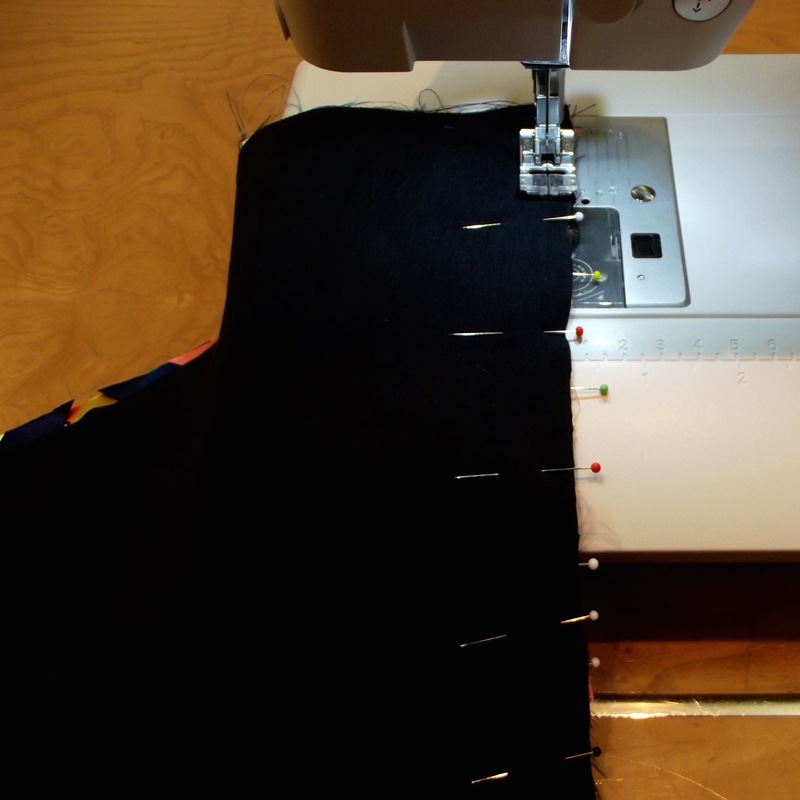 I edge-stitch on my machine because it’s faster, but hand-sewing would allow for a hidden finish. I apologize for the terrible color of this photo; I had to blow it out in order to see the stitching, which is still very hard to see! Stuff the lining inside the purse body. 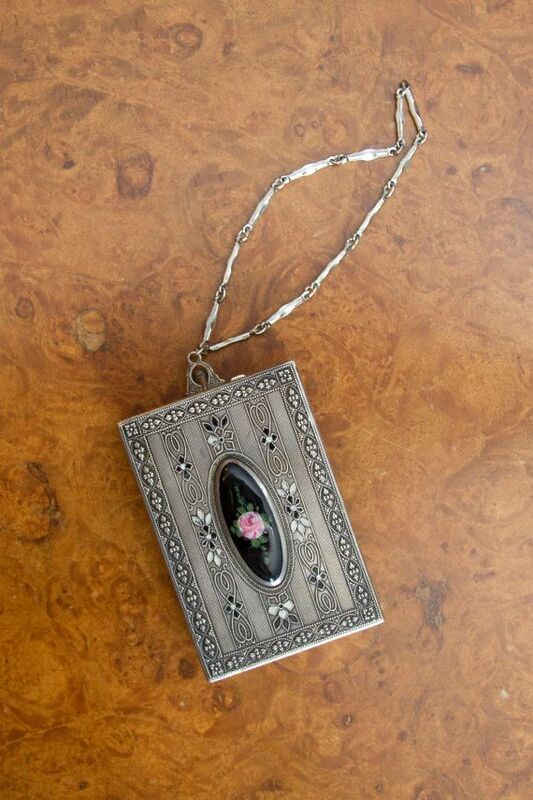 You may wish to iron the purse top to help keep it in place. 12. 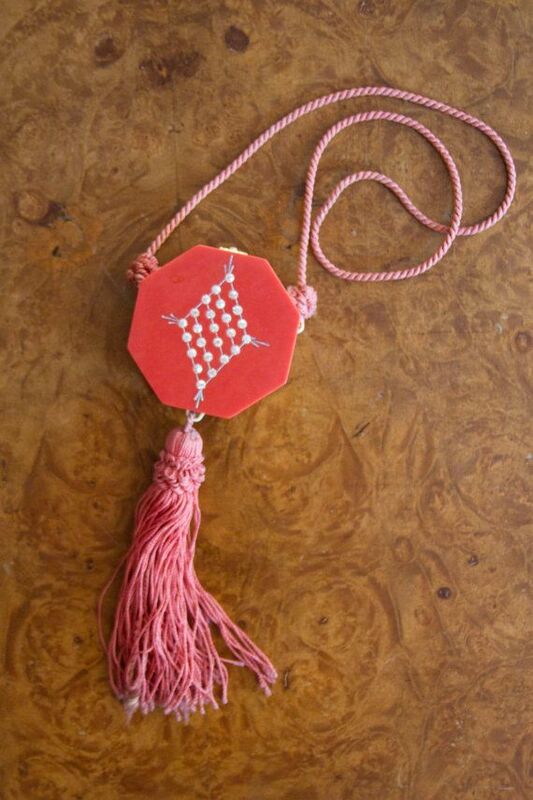 If you want to make your own tassel, do so now. I followed this tutorial to create mine. 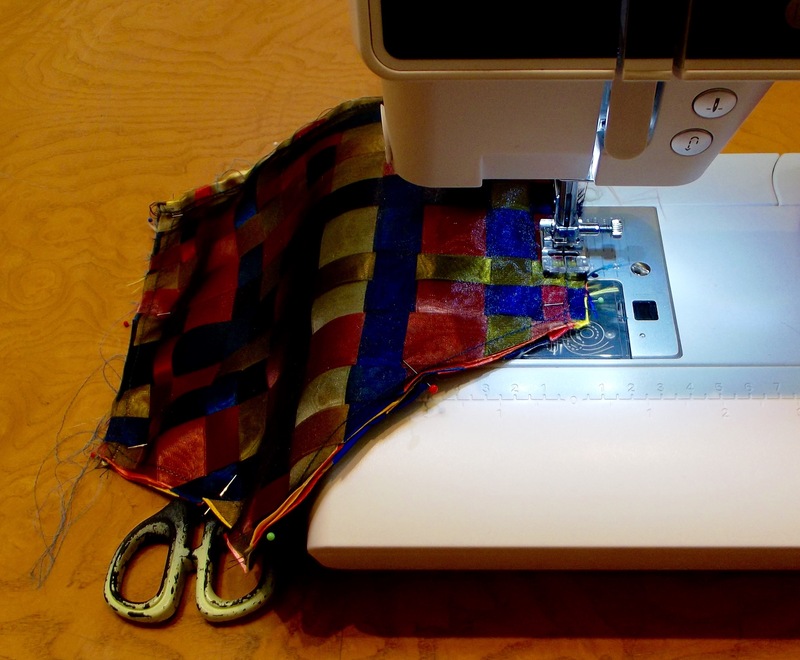 Sew to the bottom of your purse. Catch the lining, if applicable. 13. For handles, cut cording into two 1yd pieces. Beginning on one side of the purse, thread one end of the cording through the ribbon loops, meeting the second end at the start. Knot the two cording ends together. With the second piece of cording, start on the opposite side of the purse and thread through the loops. Knot ends. 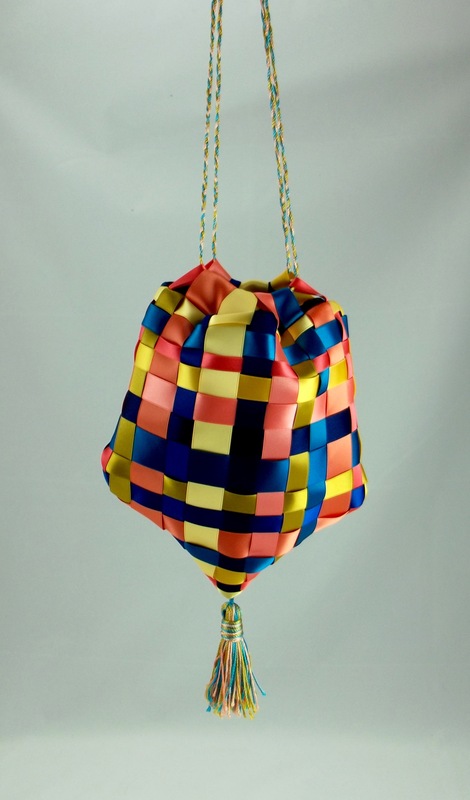 You may need to adjust one of the knots so the handles hang evenly. 14. That’s it! 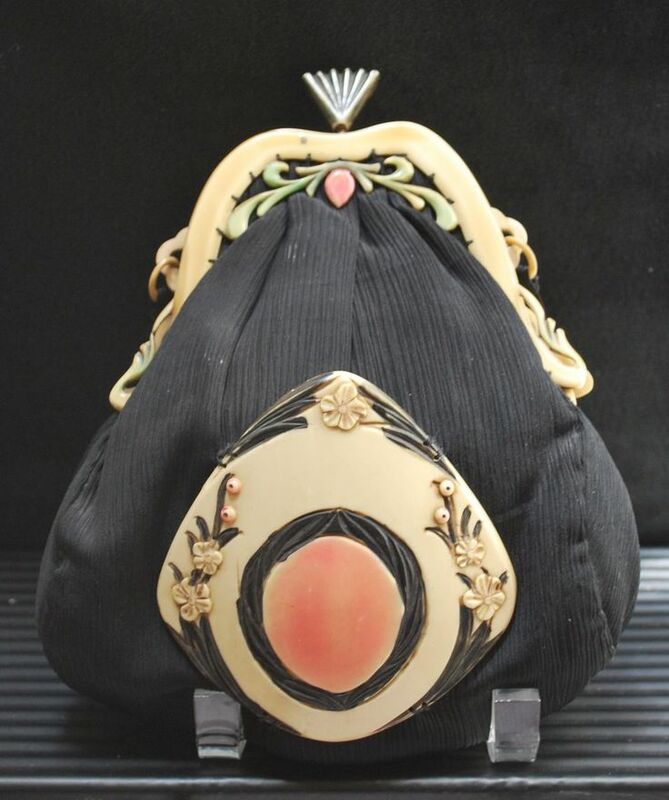 You have a fabulous new purse! Take it out for a night on the town! Join me next time for the final installment! 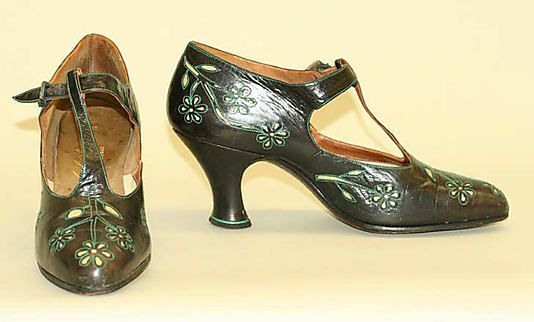 I will be sharing a fun way to update modern shoes to look like they are from the 1920s AND revealing my full costume! Until next time! 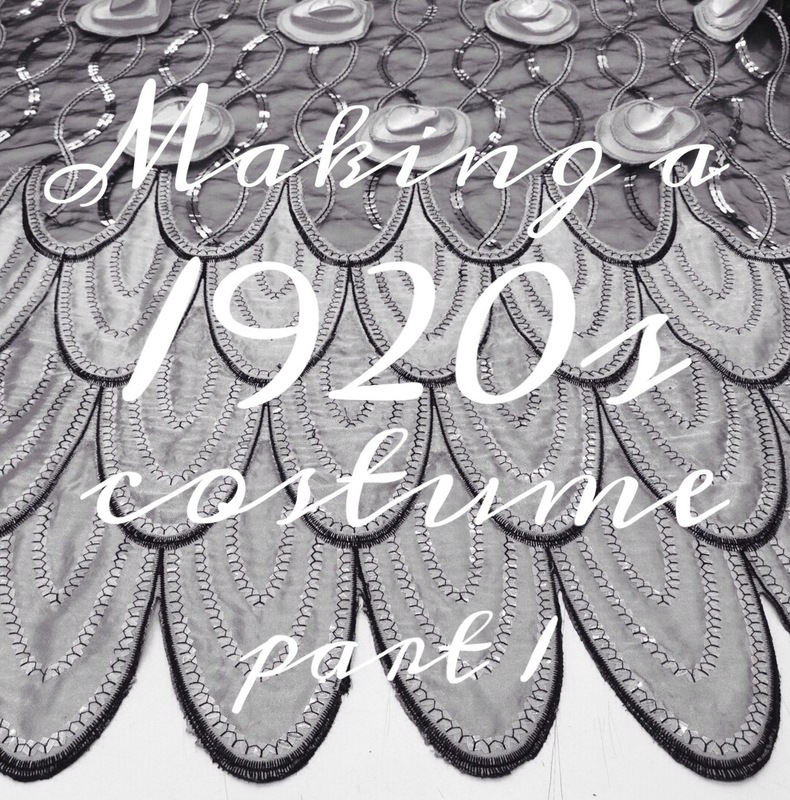 Welcome back for part two of my experience making a 1920s costume! Now that my dress is made, it’s time to start accessorizing! This week, we’ll start at the top. Of my head, that is 😉 And not only will I share what I made, I created a tutorial for you­ so you can make your own! 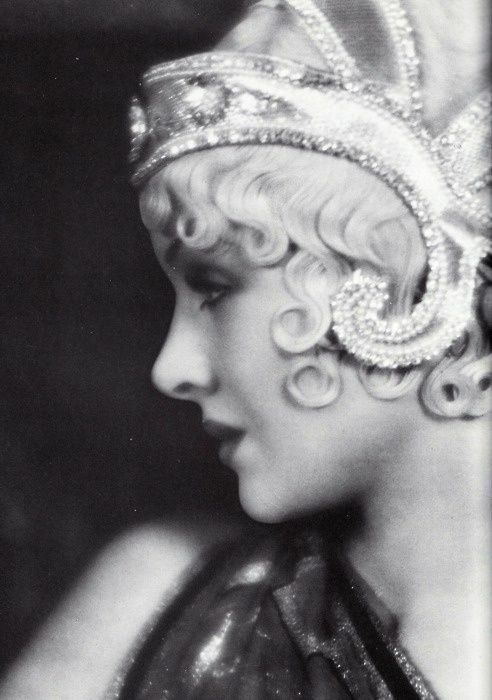 Let’s make a roaring twenties headpiece! 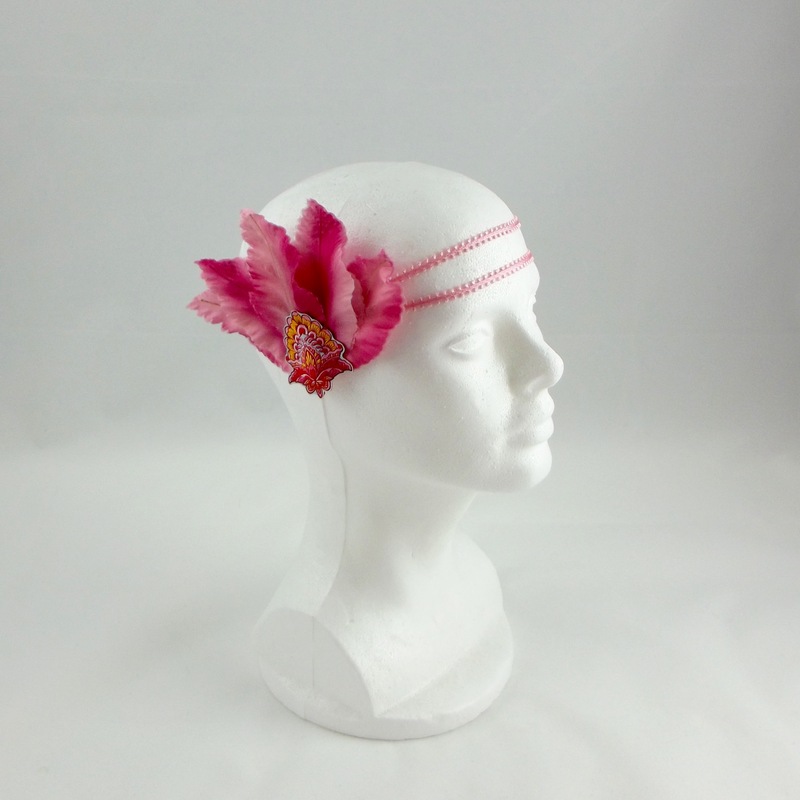 When thinking about creating a headpiece, I wanted to find just the right style. 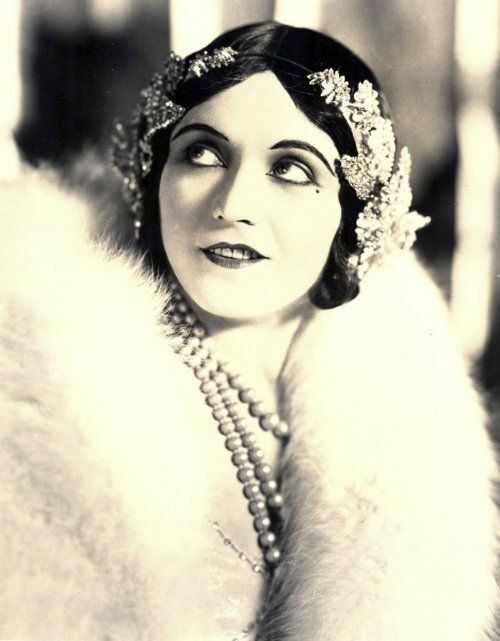 I knew that whatever I made, I wanted it to befit the aesthetic of my dress and, potentially, look like it was actually from the twenties. 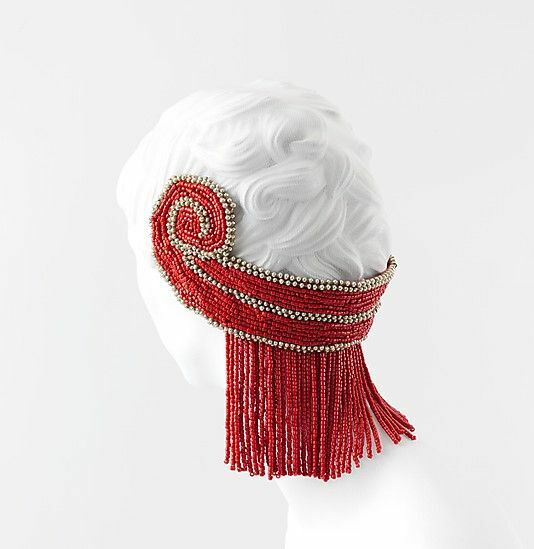 I also wanted to avoid making something that could be purchased from a cheap costume manufacturer (specifically: the cartoonish flapper headband made out of stretchy sequin trim with a feather in it). 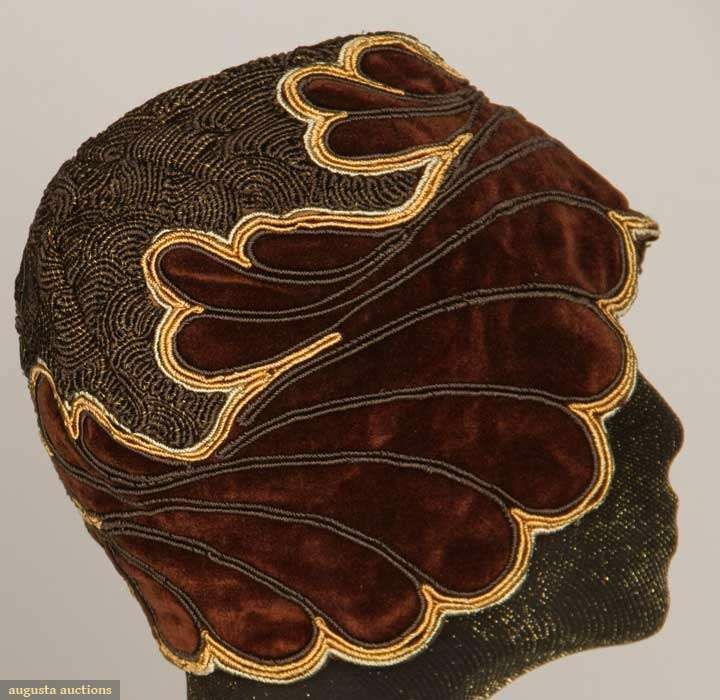 In researching, I found that for headwear, as with dresses, the 1920s offer a lot of opportunity for exploration of silhouette within the general design aesthetic of the period. 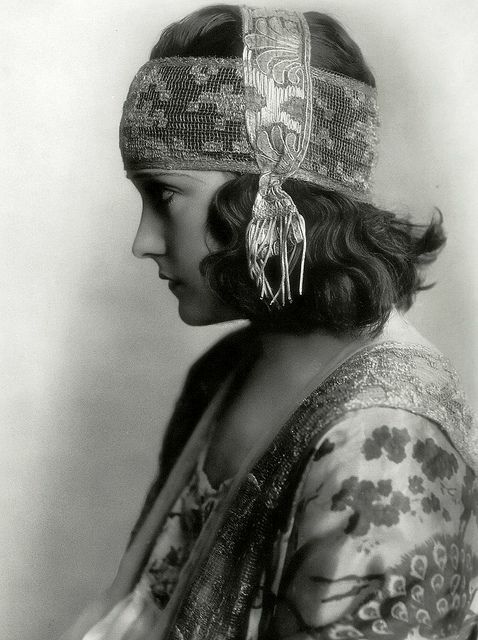 There is no shortage of incredible inspiration in twenties headwear! 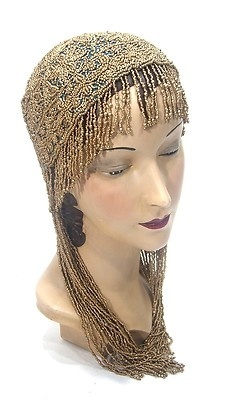 Three main styles of 1920s women’s evening headwear stood out to me: flapper caps, evening cloches, and headpieces. 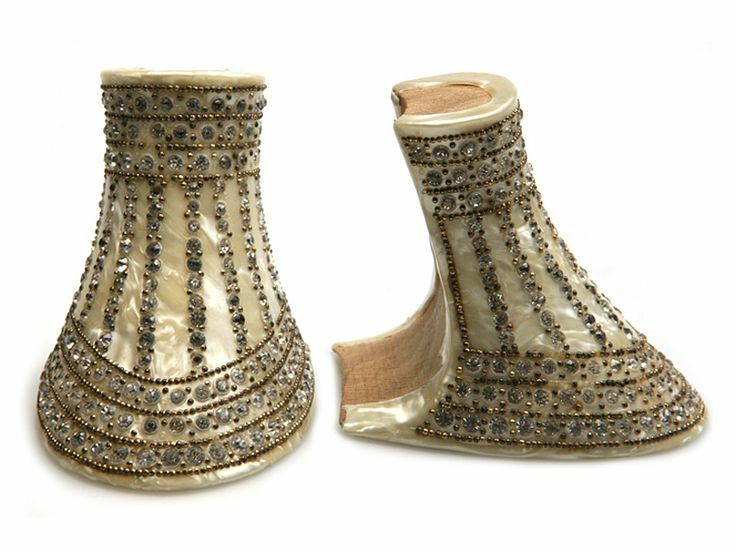 I’d like to share some of my favorite pieces I found during research! Evening cloches provide the most coverage. 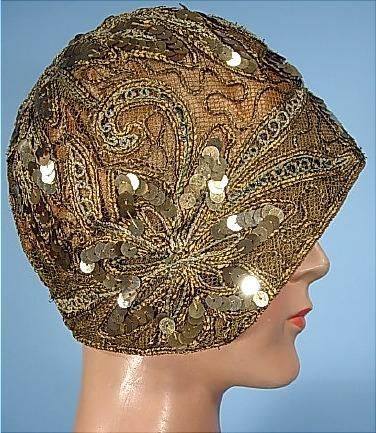 They are full cloche-style hats that have been decorated with sequins, beads, rhinestones, lace, velvet, and more. 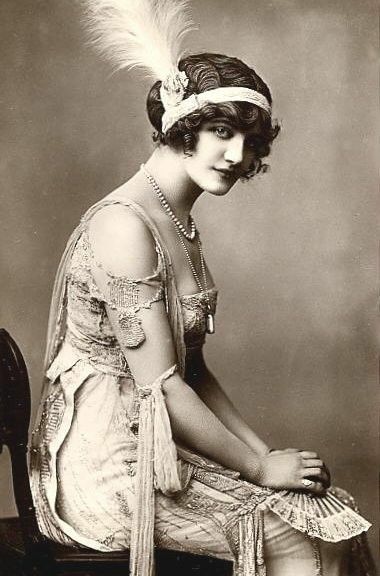 Flapper caps have less coverage than cloches, though still cover most of the head. 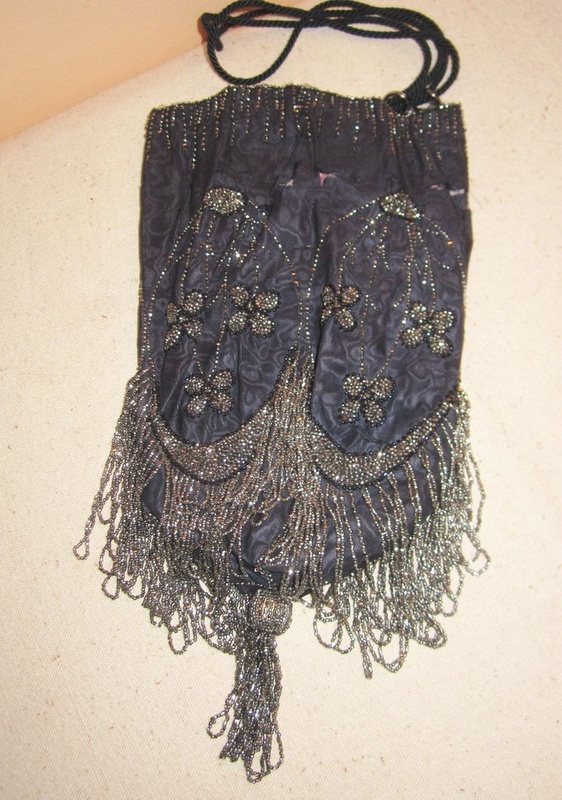 They often have a row of fringe around the bottom or tassels, which provide extra movement when dancing the Charleston! 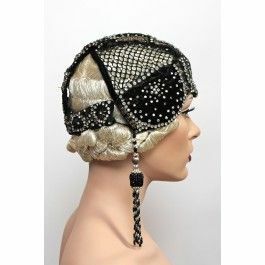 Headpiece is a kind of catchall category for headwear that provides minimal coverage, including headbands, tiaras, and bandeaux. 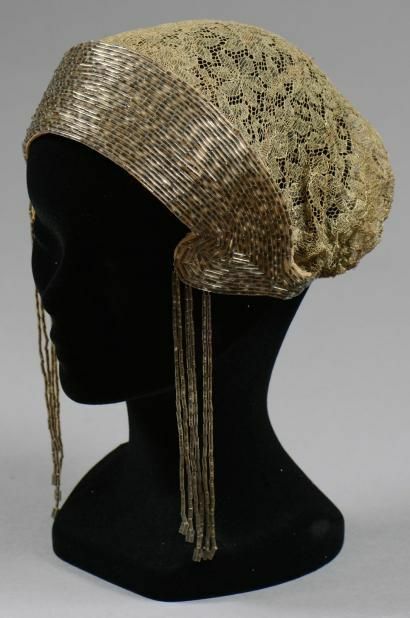 Though I would have loved to make an evening cloche, due to my time constraints for this project I decided to make something that falls into the ‘headpiece’ style. 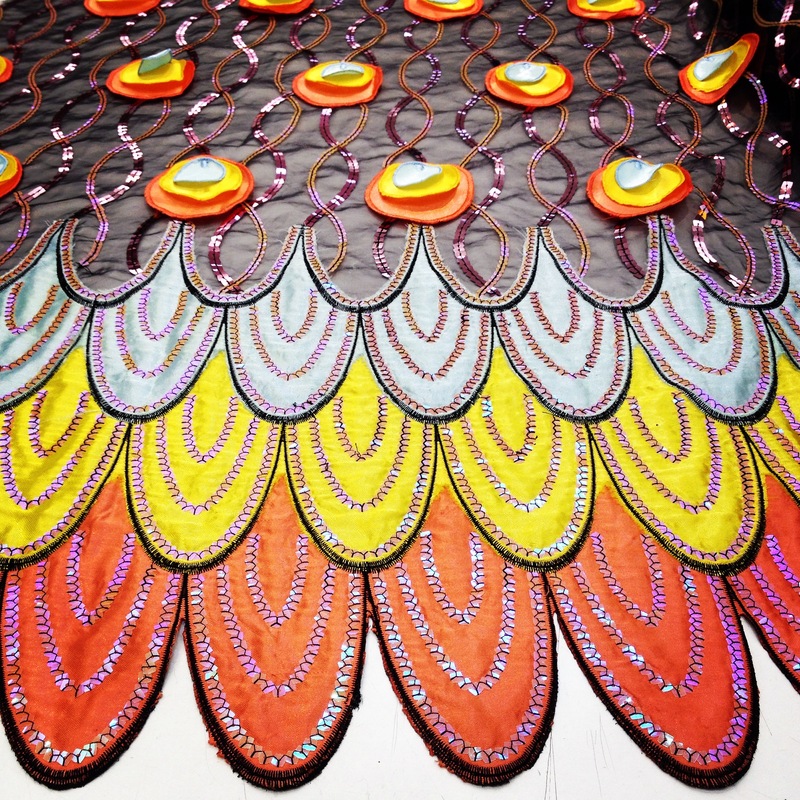 Inspired by the color palette and peacock motif of my dress fabric, I started searching for materials and designs. 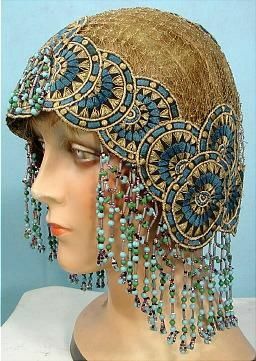 Initially, I thought that using peacock feathers might be suitable for my headpiece. 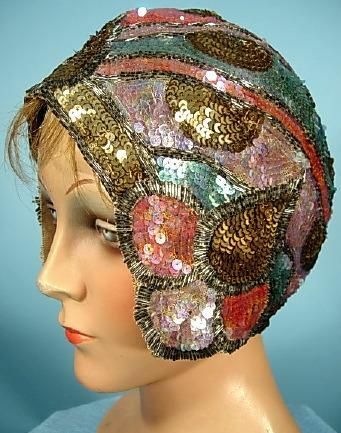 Peacock feathers are an incredibly popular choice for contemporary versions of 1920s headwear. 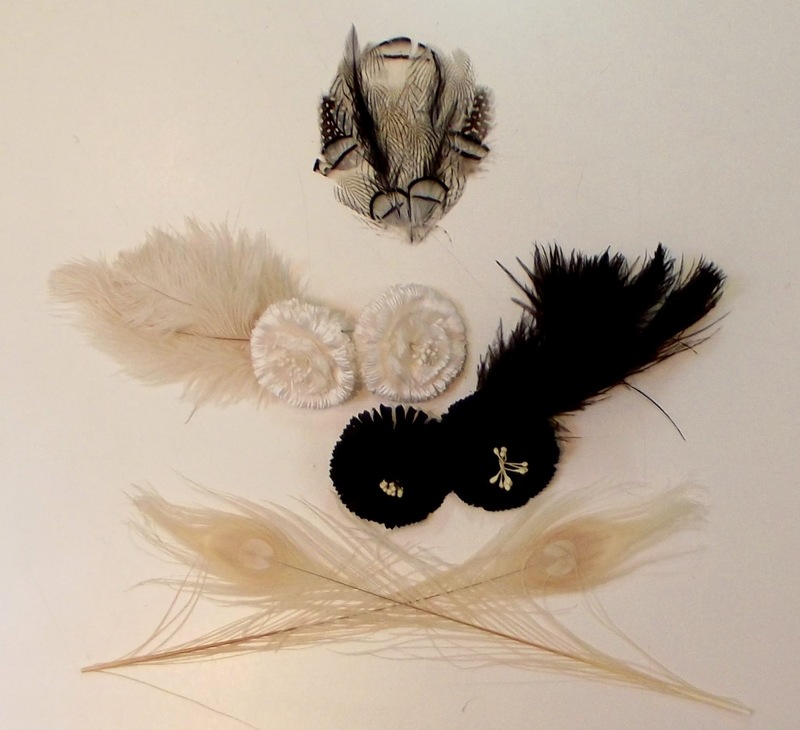 At Nancy’s, we have a lovely selection of millinery supplies, including feathers and feather pads. 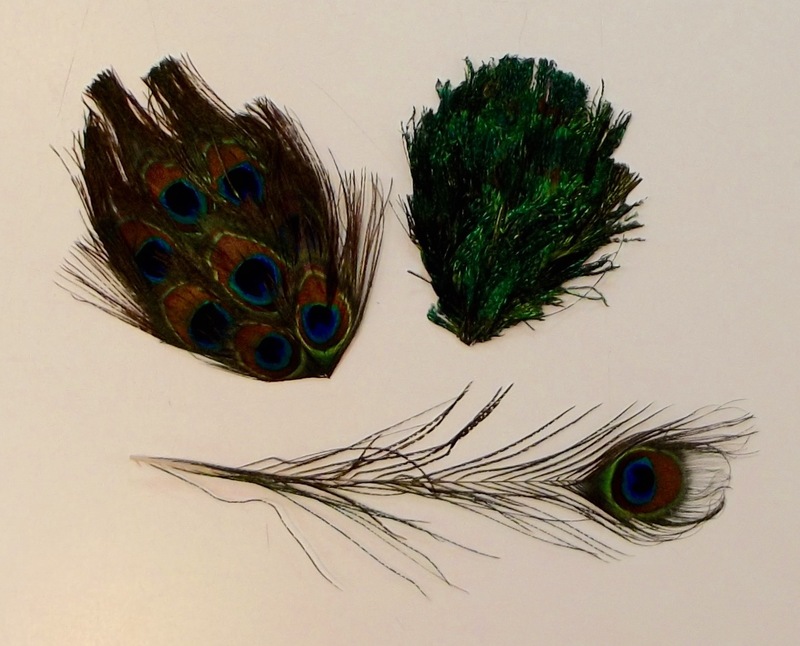 I pulled all our peacock feather options for consideration. 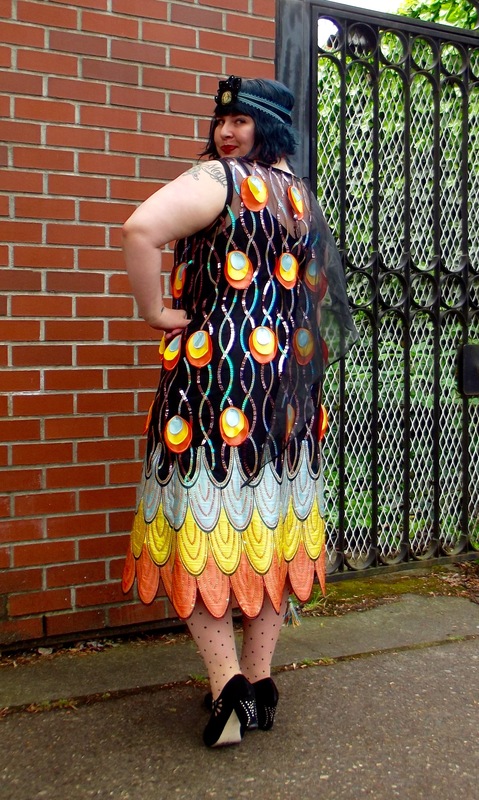 On reflection, I decided that the coloration of natural peacock feathers competed to much with the colors in my dress fabric. I decided to pull more neutral options in millinery supplies. 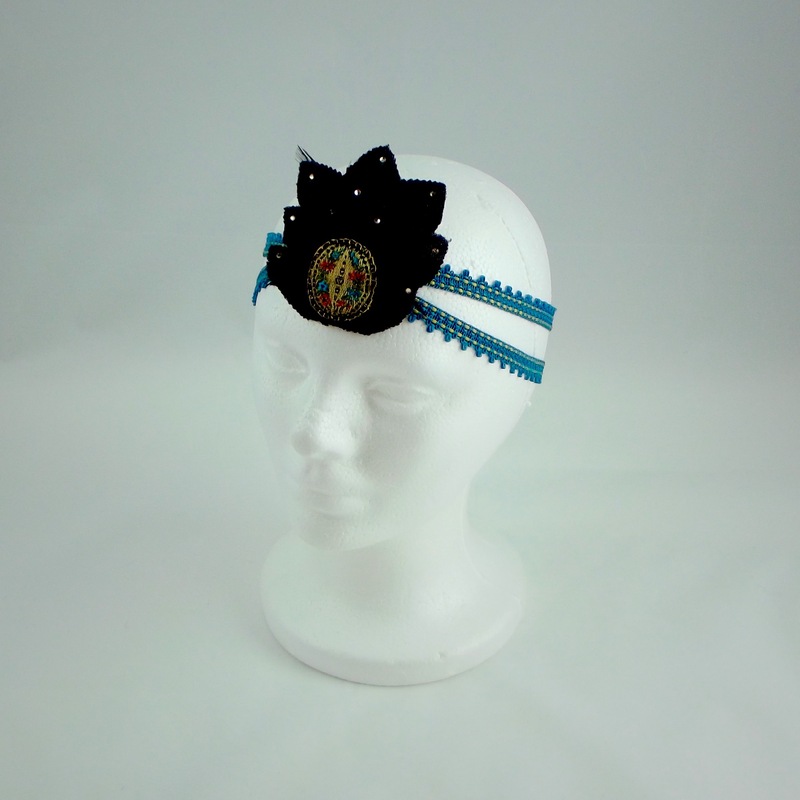 While I liked the look of the black and off-white options, I also wanted my headpiece to be more vibrant and colorful. I stepped into our fabulous Ribbon Room to look for inspiration. 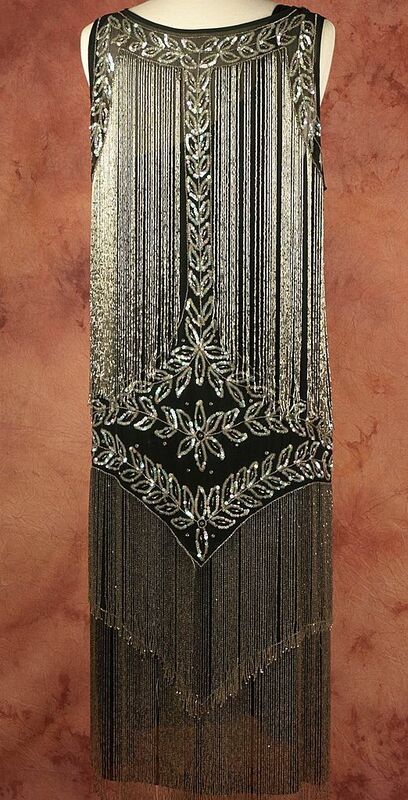 With the color palette of my dress in mind, I found the perfect trim to use for the band: a turquoise Art Deco-look woven trim with a graduated picot edge on one side. From there, I picked up a gorgeous vintage ribbon woven in gold metallic with black and pops of orange-red, blue, and green. 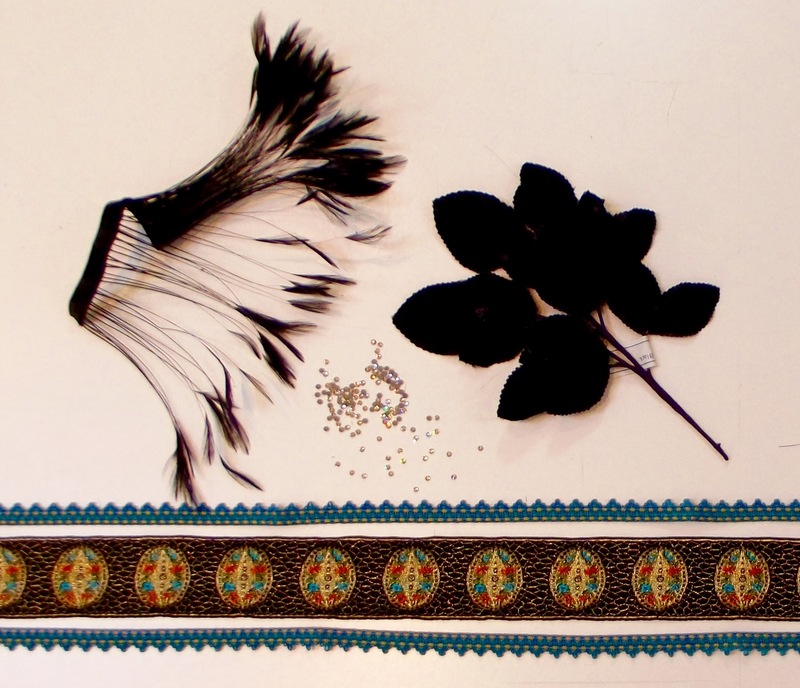 I selected black velvet millinery leaves to create a base, and for a bit of additional texture, I chose small black feathers and Swarovski® crystals. 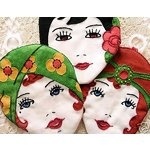 Amusingly, I found the perfect inspiration for my design in the form of a vintage potholder. 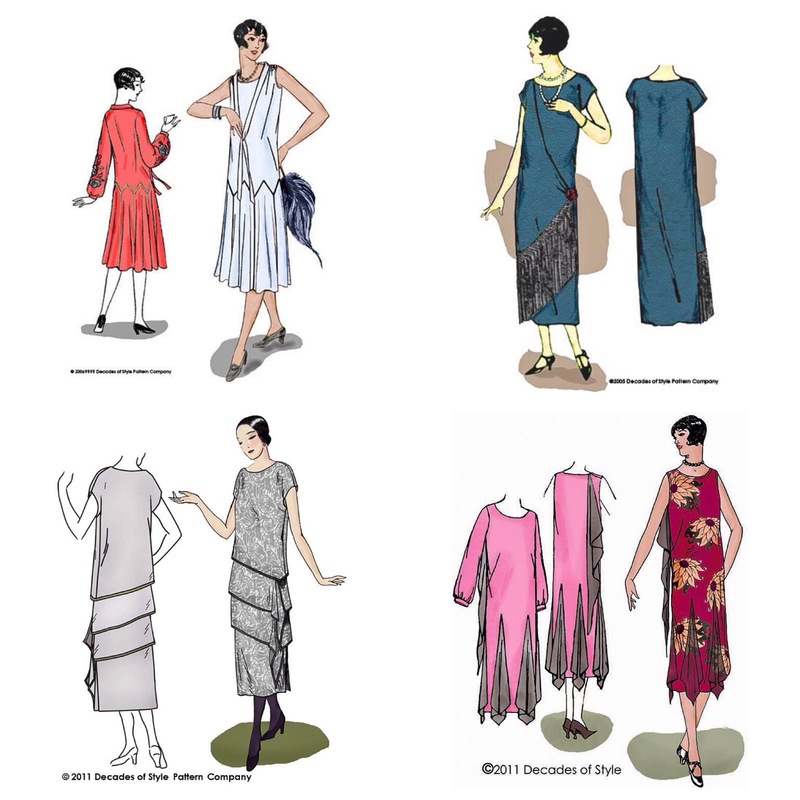 My design was inspired by the flapper on the far right. 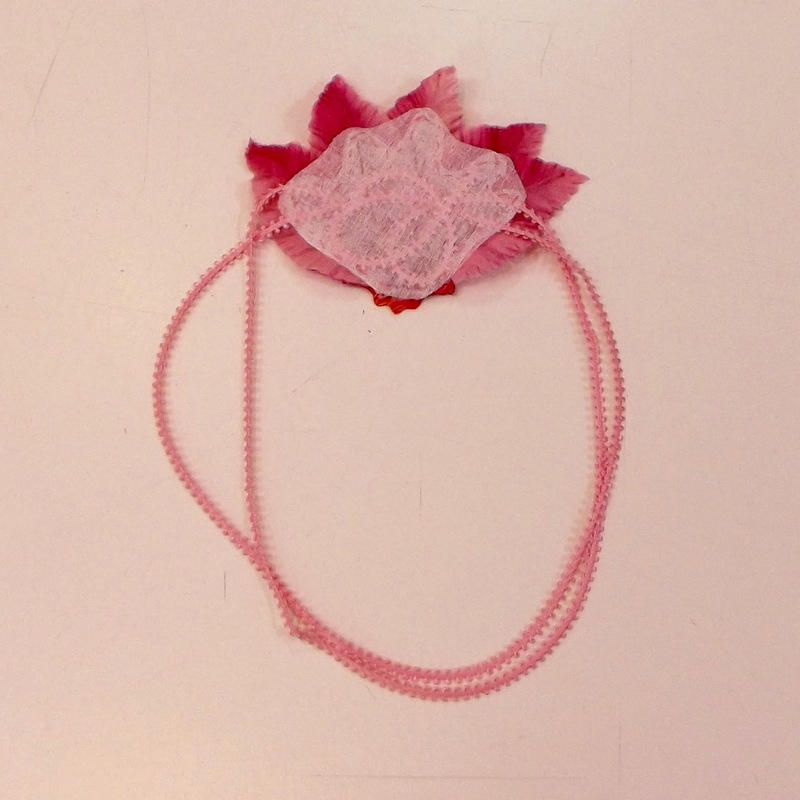 With my supplies on hand and my design in mind, I made my headpiece. I absolutely love how it turned out! You’ll have to check back to see me wearing my headpiece in the final reveal! 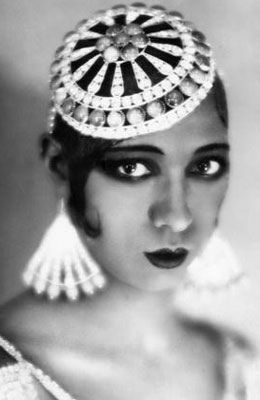 In the mood to make a 1920s inspired headpiece? Follow the tutorial below to make one of your very own! 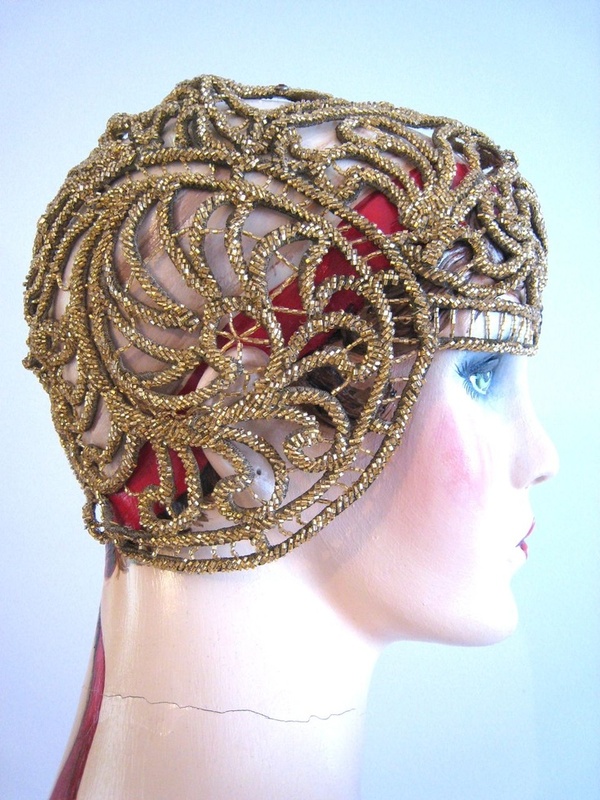 Please note that this headpiece will be constructed in the same fashion as the one shown above, but for ease of photographing, I am making it in a different color palette and using different materials. 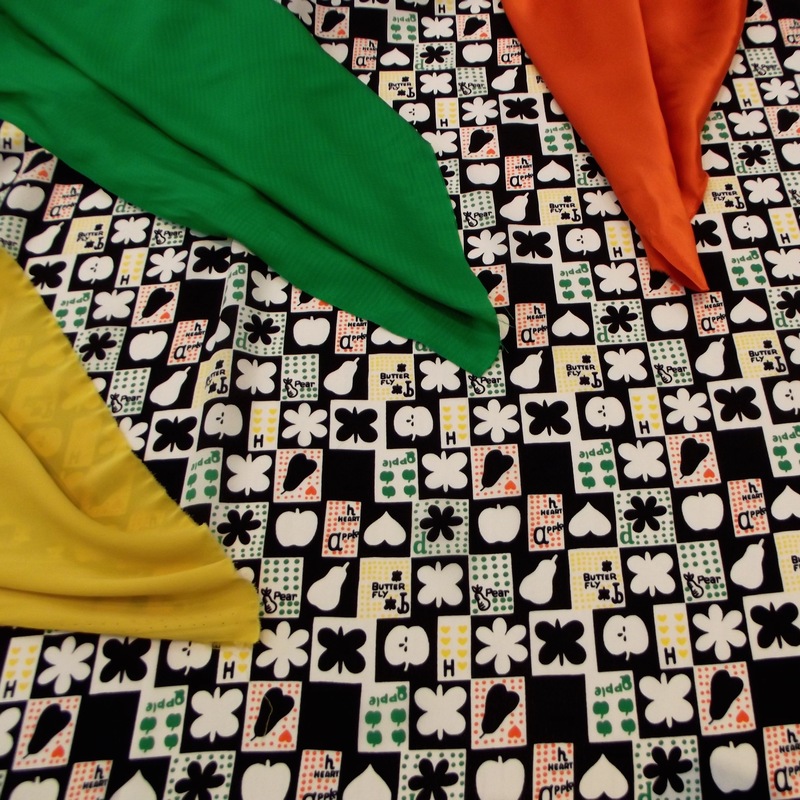 This is an easy hand-sewing project that is also super fun! 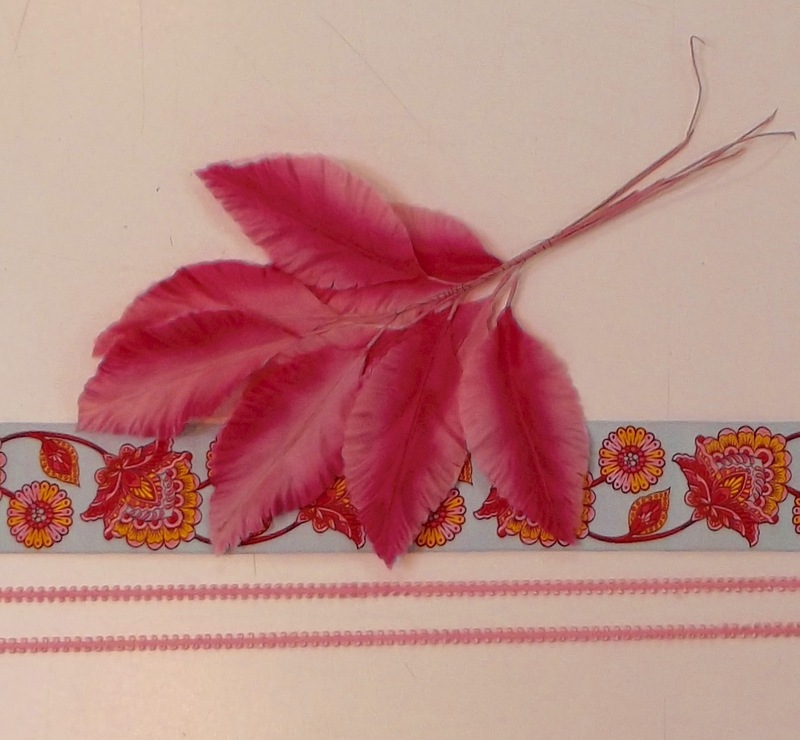 Supplies for this tutorial: the beautiful vintage millinery leaves feature color variances on each, double-layer leaf; I selected a ribbon with an interesting motif for the ‘medallion’ and a pretty, double picot edge vintage trim in light pink. 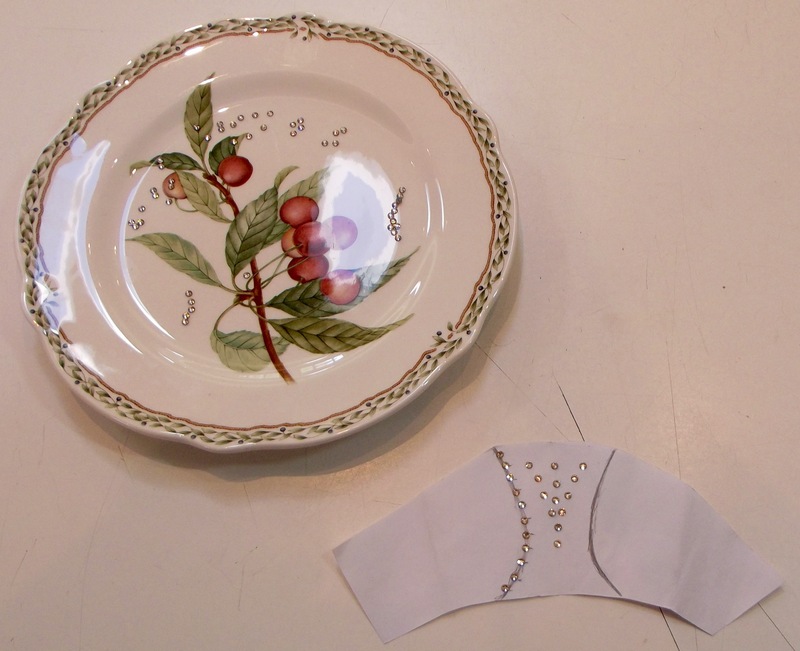 Rhinestones (optional; can use heat-set, sew-on, or set-in; not depicted here); sequins would also work well. 1. 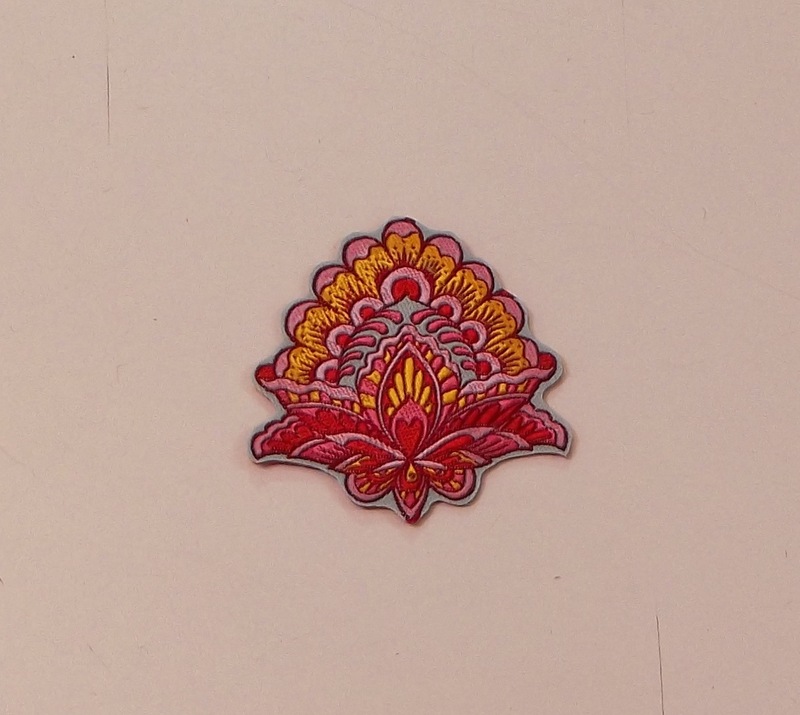 Use Fray Check around edges of medallion motif. You can see the ribbon is a touch darker around the larger and smaller motifs; this is where I added Fray Check. 2. 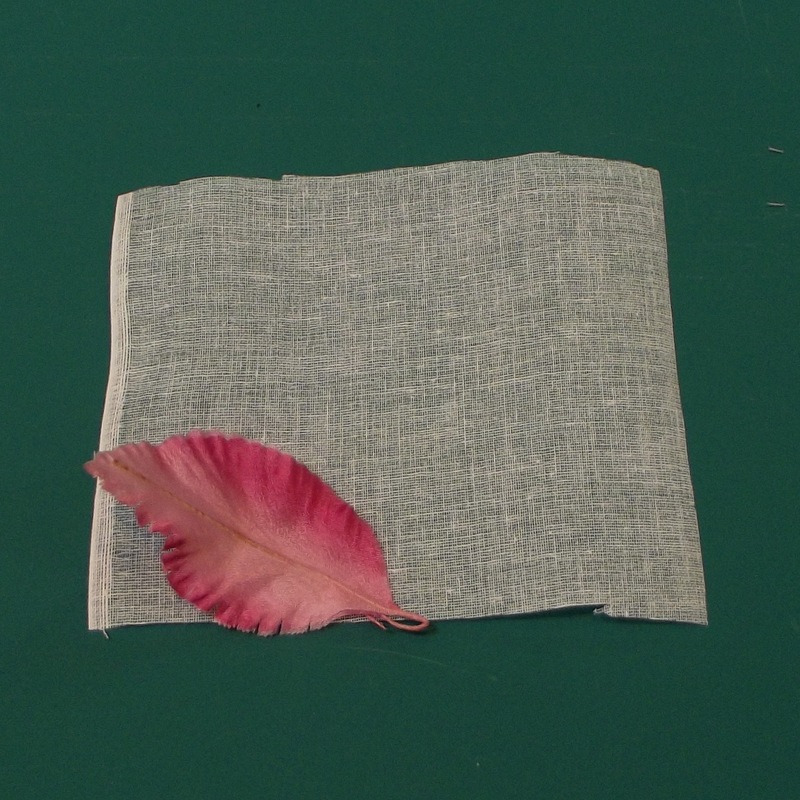 Separate millinery leaves and select what you want to use. 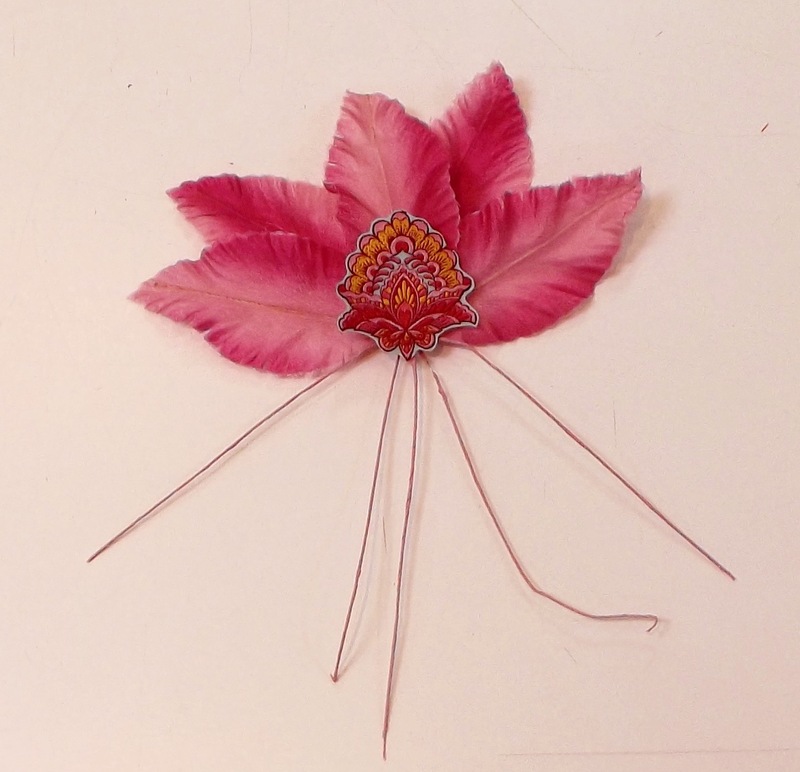 I found that I had four leaves where the darker pink ran through the center, three with the darker pink on both sides, and two with the shades were about half-and-half. 3. Arrange your leaves and medallion motif. Be certain to try different arrangements for the best effect! 4. 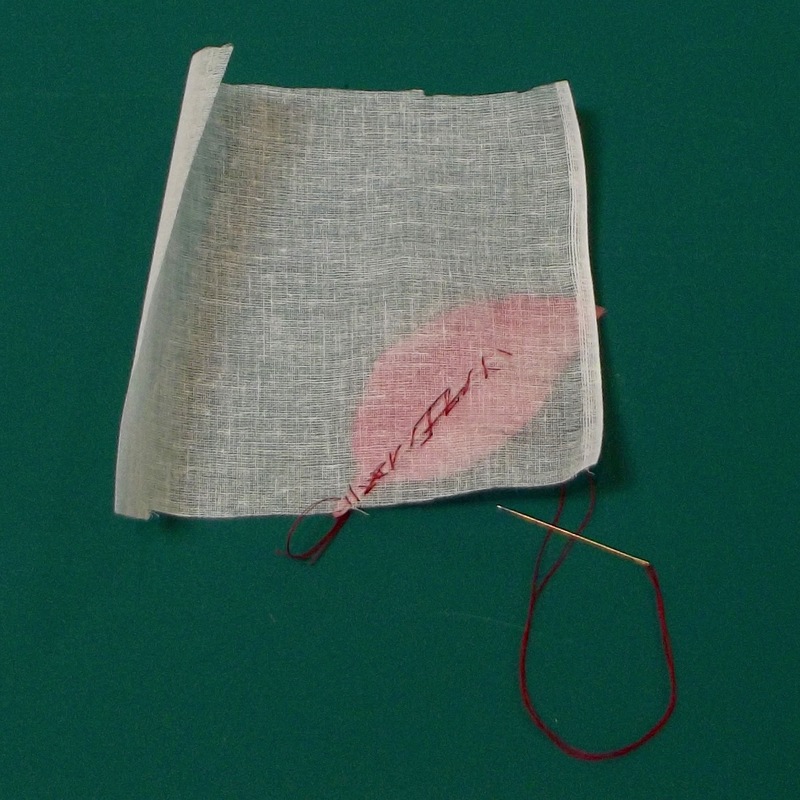 When you are satisfied with your arrangement, begin to sew the leaves to your crinoline. The nice thing about a project like this is you don’t need to stitch a lot; some simple tacking does the trick! 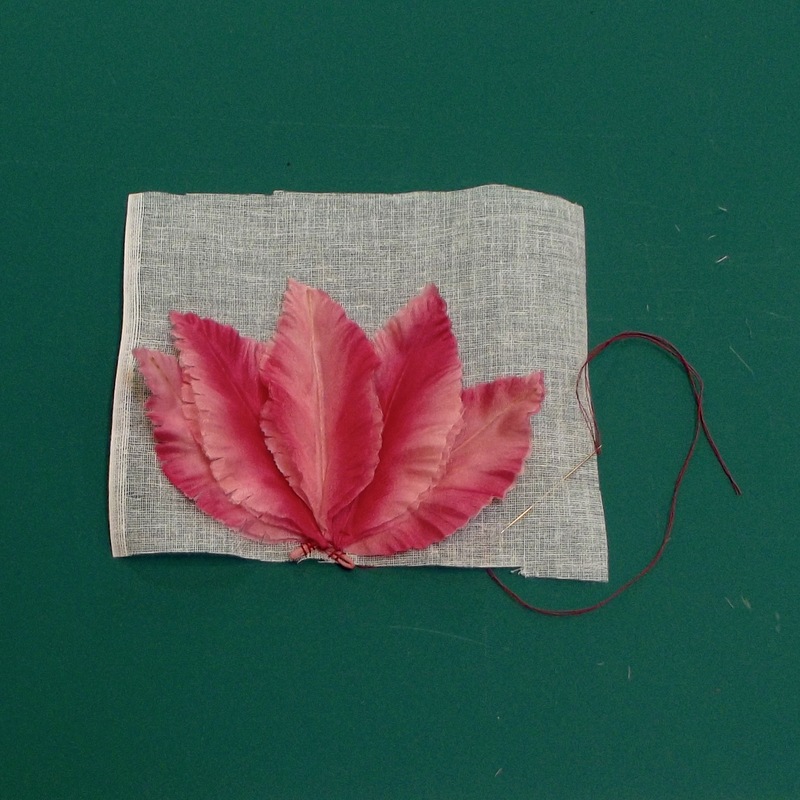 Because my leaves are double layer, I was able to hide my stitches between the layers. On the back, you can see where I’ve tacked my leaf to the crinoline. This is more stitches than I need for this; I could easily have done 1/3 as many stitches and been totally fine. 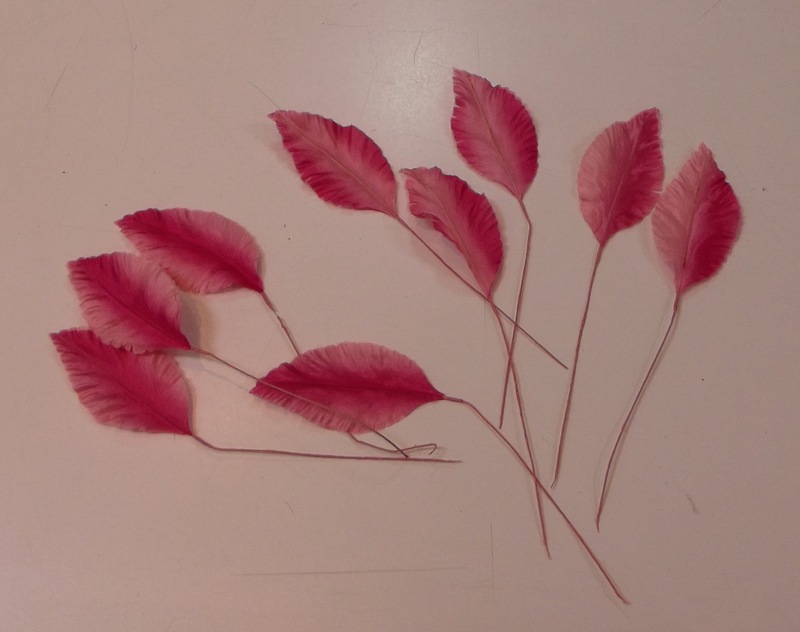 Note: If you are adding feathers, I recommend sewing at the same time as each individual leaf. 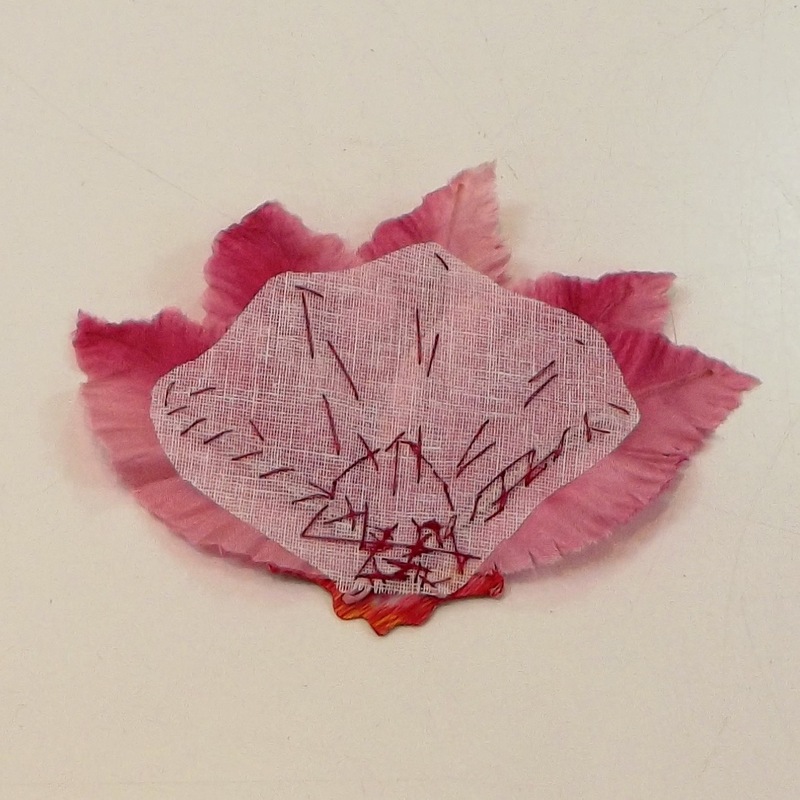 Continue to add the leaves until they are all tacked to the crinoline. 5. 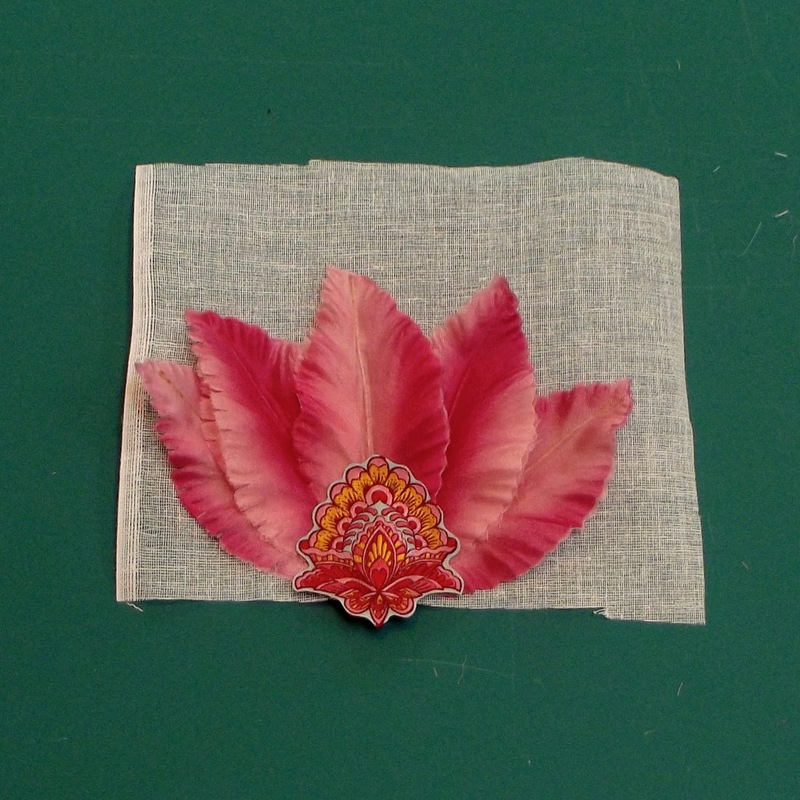 Add the ribbon motif to the leaves. Find the right position and tack it in place. Turn the whole thing over and trim away the extra crinoline. Be sure not to snip your stitches! 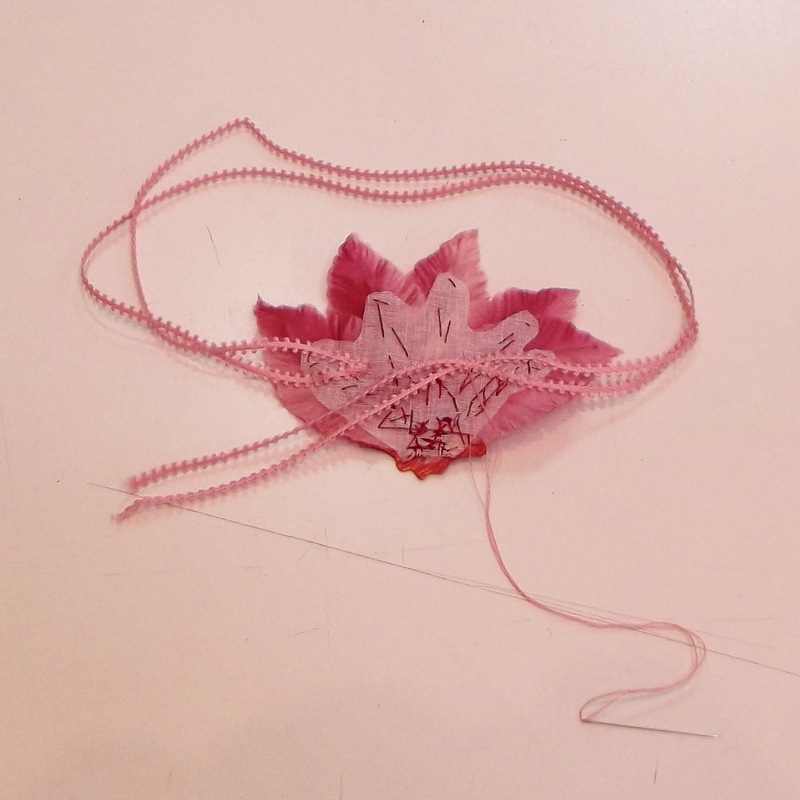 You can see that I used fewer stitches for the three center leaves. Note: If you are adding rhinestones, I recommend doing so at this time. 6. Now it is time to add the band! Start by folding the trim in half and sewing it to one side of the crinoline (I always start with the left side). 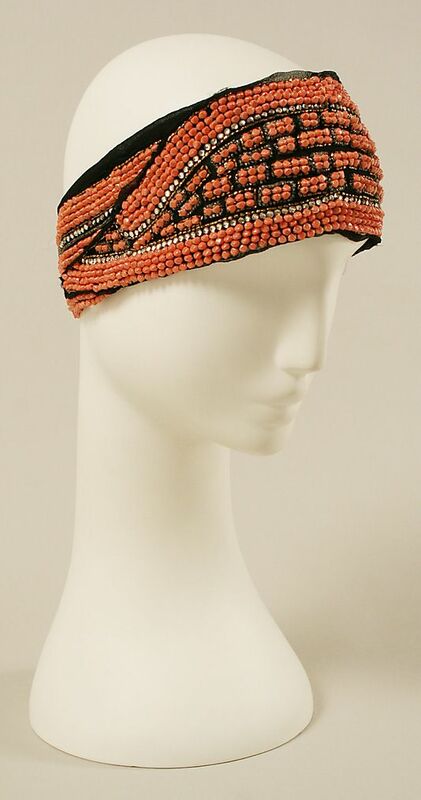 Once that’s in place, try it on and adjust the loose ends of the trim so the headpiece is comfortably snug. 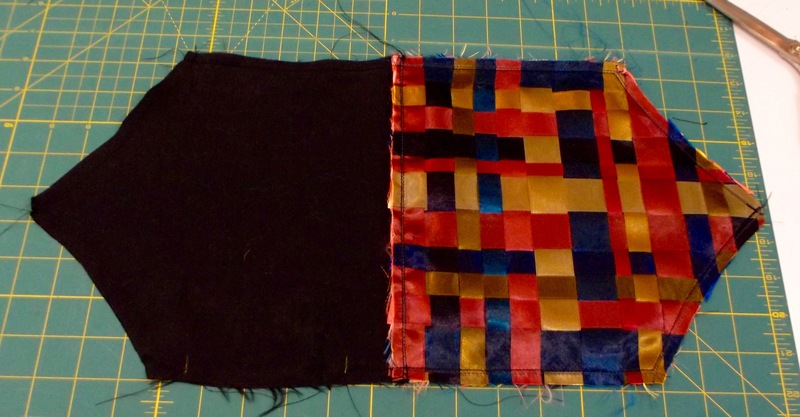 Pin and sew to the other side, mimicking the shape of the already sewn trim and how it is folded. On the left: trim folded in half and sewn to the crinoline. On the right, the adjusted straps, being tacked in place. 7. 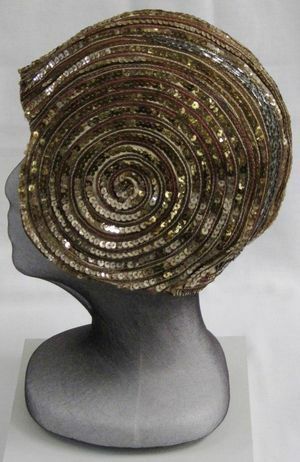 Finish the back side of the headpiece. I use another piece of crinoline, but other good options include felt or a piece of fabric that won’t unravel. Tack around the edges of both crinoline pieces, then trim the outer layer! 8. 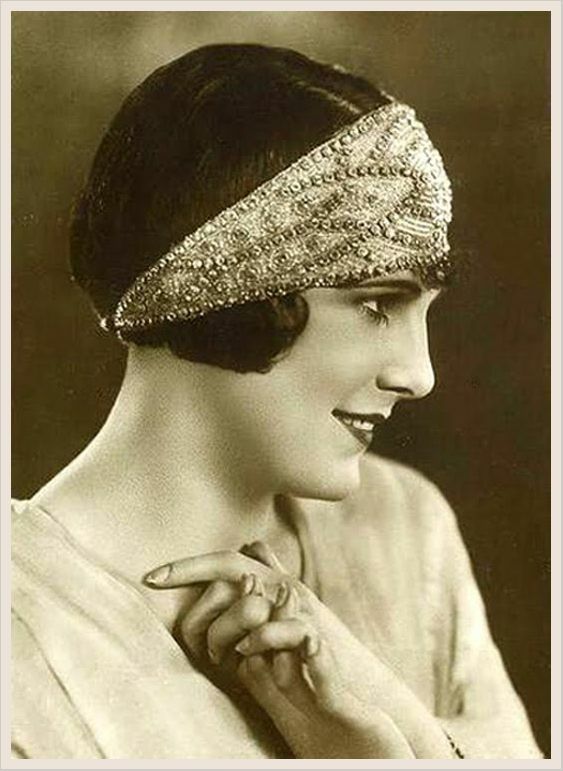 Try on your beautiful new 1920s style headpiece and admire your handiwork! 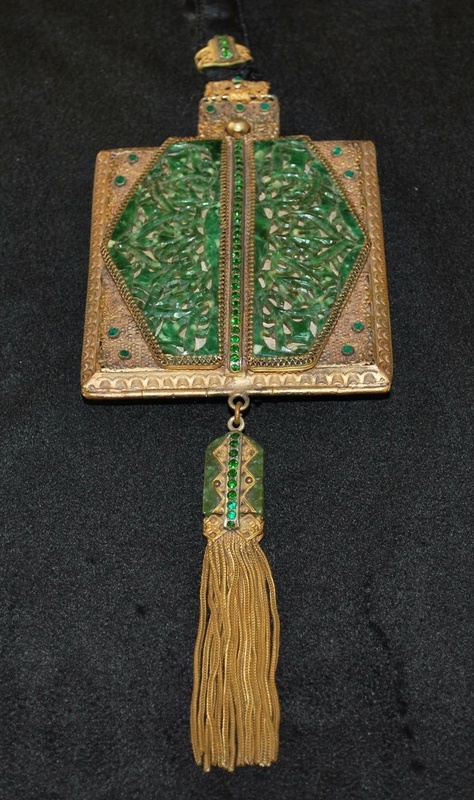 Join me again for the next installment when I make a purse to coordinate with my ensemble! I have some particularly fun inspiration to share! And stay tuned for the final reveal! Jessica here! 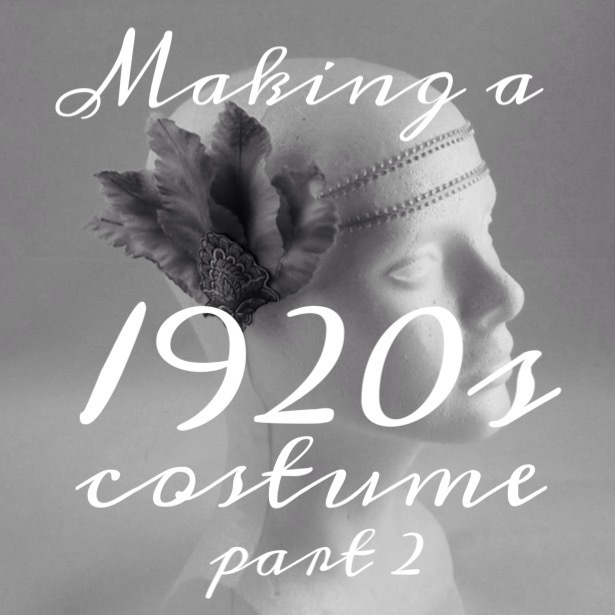 Welcome to our newest multi-post series, where I talk all about creating a 1920s costume and accessories. 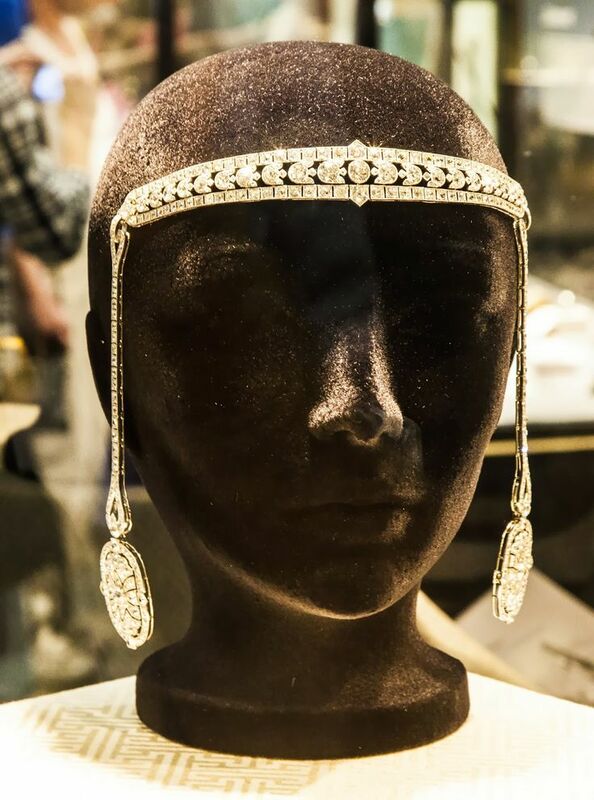 I am excited to share with you all the details and planning that went into making a fabulous ensemble for my friend’s Roaring ‘20s themed birthday bash! 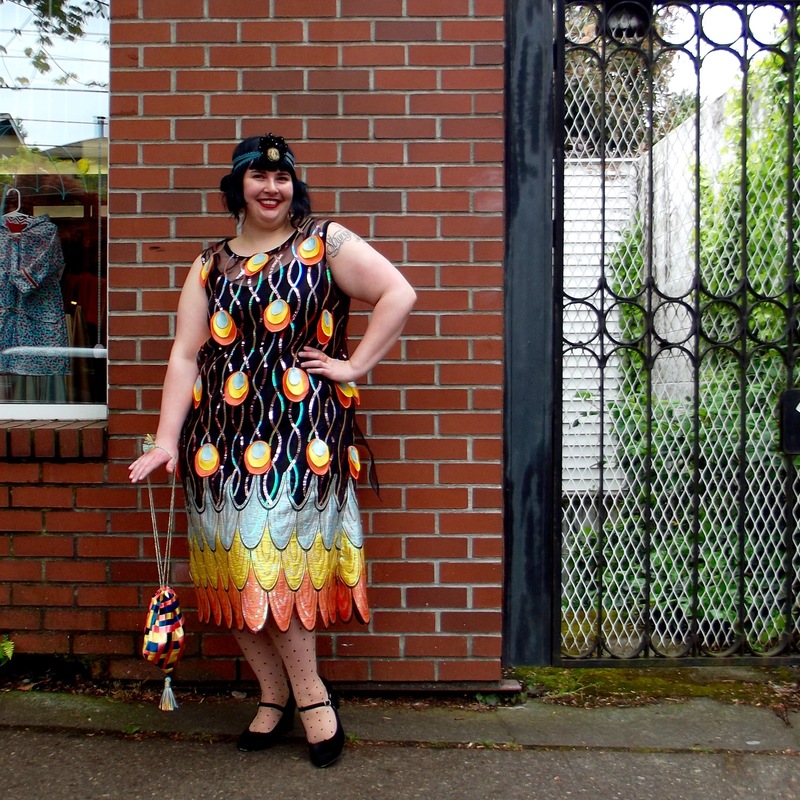 As a plus size woman, I knew that it might be difficult to find a 1920s costume off the rack. 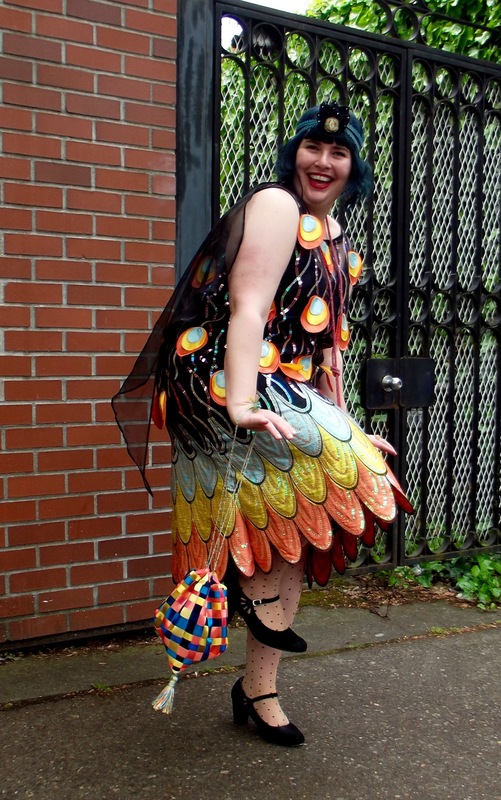 Because I love costumes and making fun ensembles, I figured I might as well make something fabulous for this party! Today I will go over pattern and fabric selection and share a lot of the beautiful inspiration I found. 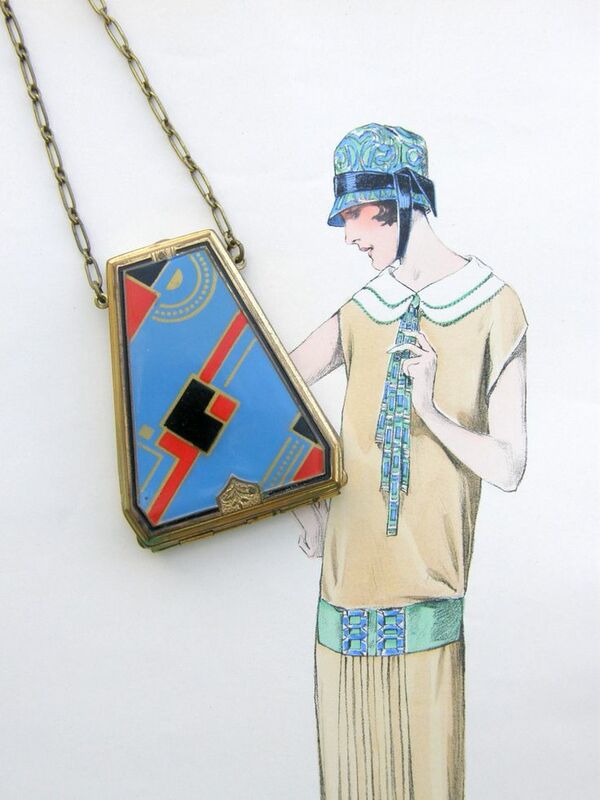 The 1920s: such a fabulous era for gorgeous clothing, accessories, and details! 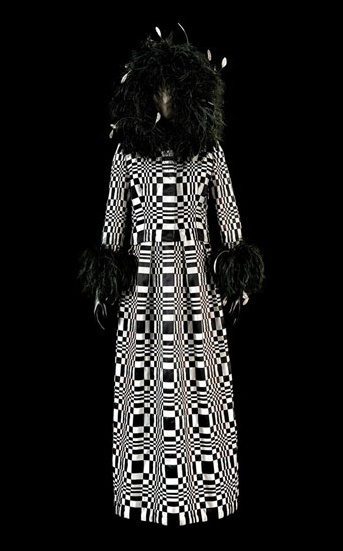 After receiving the party invitation, I started looking at possible patterns. I don’t have the ‘ideal’ twenties figure and I’ve never really worn drop waist silhouettes, so I looked for a style that I would be comfortable in, that could accommodate my full hips and, hopefully, be flattering. 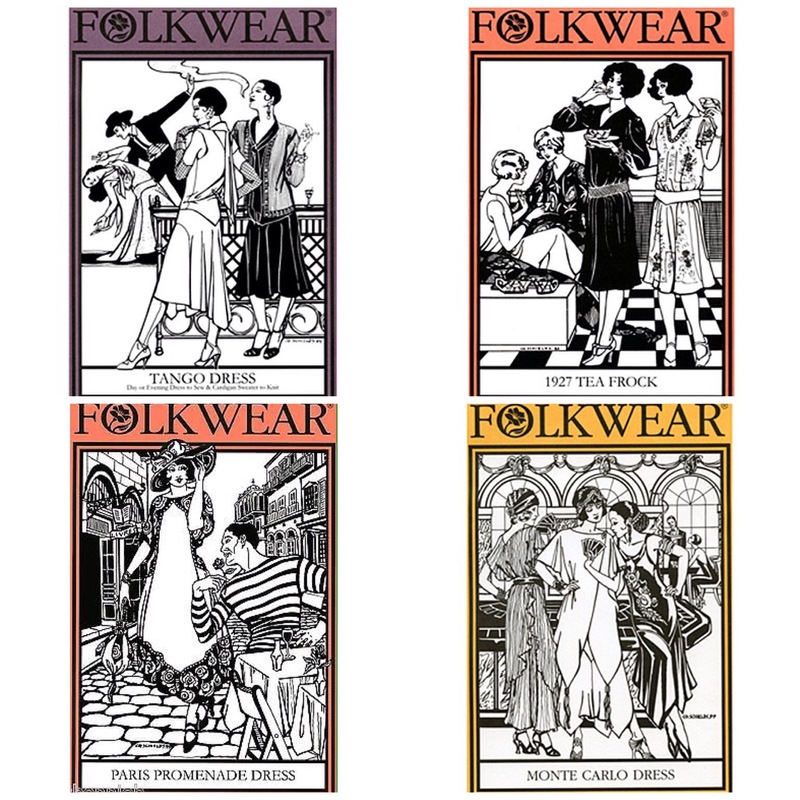 I primarily searched the independent historical pattern lines we carry at Nancy’s, Folkwear and Decades of Style, and found some great options. Once I knew what I was going to make, I had to select fabrics! This is my favorite part of any sewing project and choosing fabric for this costume was no exception! At this point, I turned to Pinterest for the never-ending visual inspiration it offers. 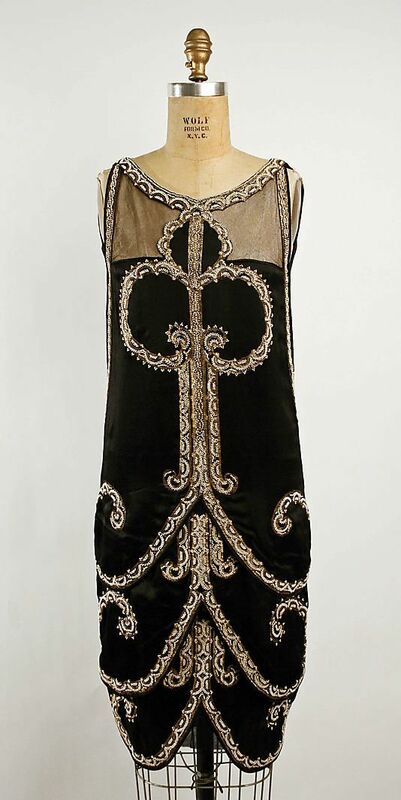 I’m going to share a few of my very favorite 1920s dresses I found there, but know there are so many other incredible examples. After gathering ideas for materials and colors, I set out looking for my fabrics. I did a quick search through my own stash and found a potential candidate for the main body of the dress. 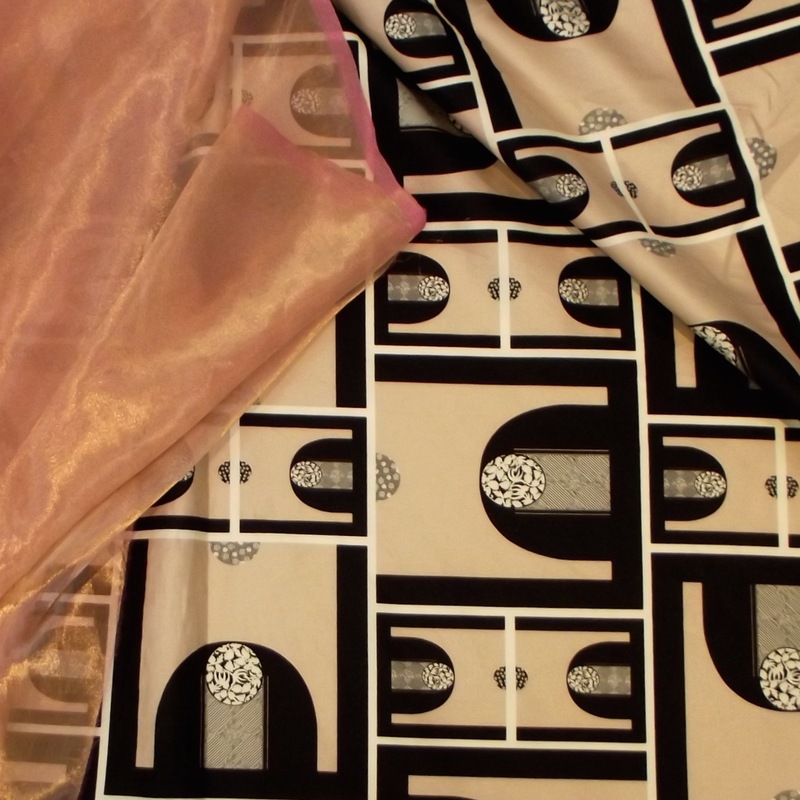 When I couldn’t find a suitable coordinate for the neck and hem scarves, I browsed the special occasion section at Nancy’s and came up with several new, fantastic combinations. And then I saw it: the perfect fabric. It was vibrant and fun! 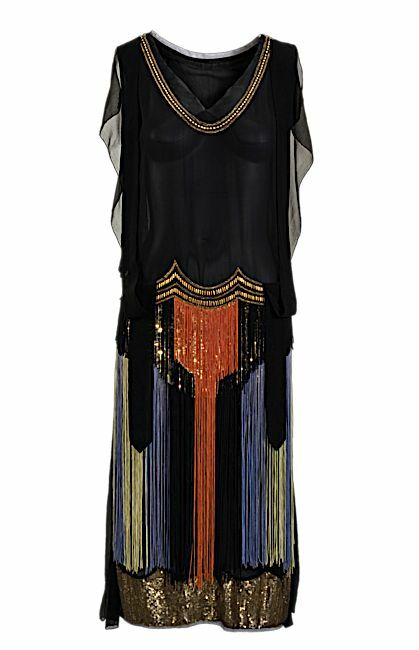 Sheer and opaque! It sparkled! And best of all: it was already embellished, so most of the work had been done for me! I wouldn’t even have to hem it! 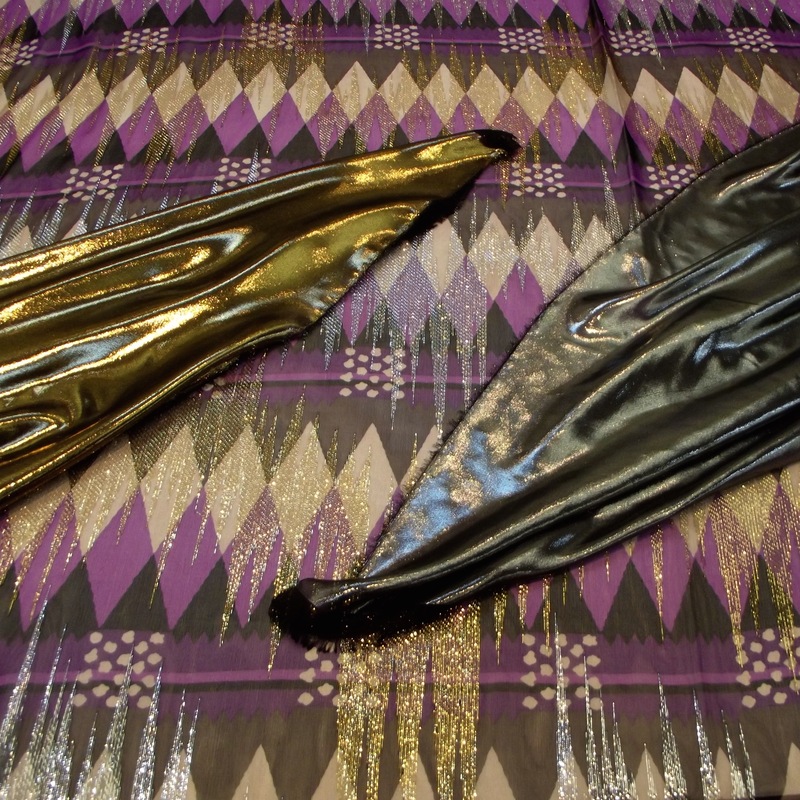 Realizing the addition of scarves around the hemline would detract from the incredible embellishment, I decided I would make only the neck scarf from the original pattern, using a simple black poly organza, similar to the basecloth. Because I chose a sheer fabric for my dress, I elected to make a coordinating slip to wear under. 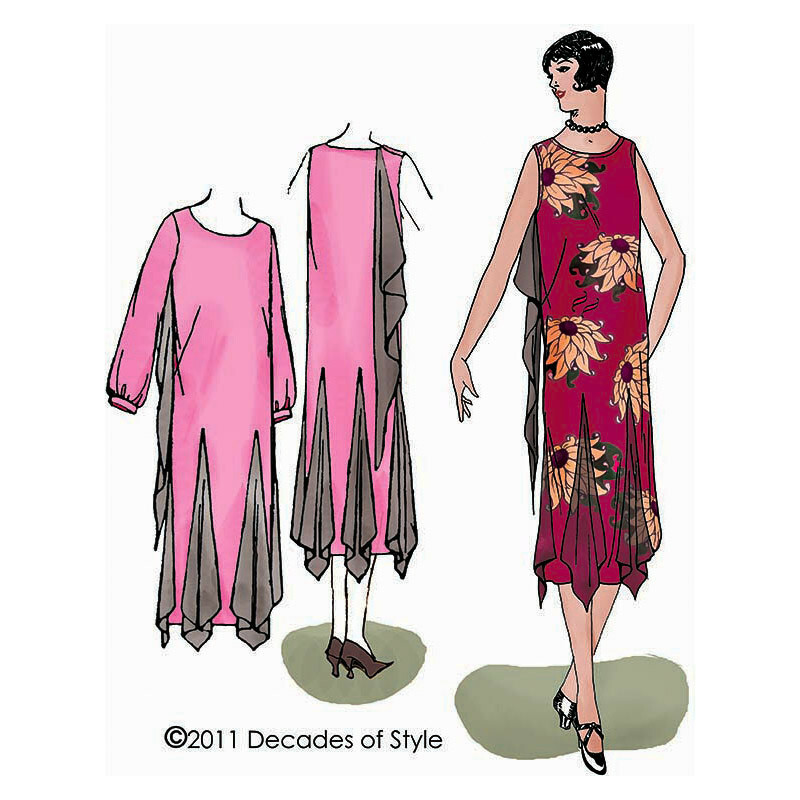 I used the fabulous Intimacies pattern from Folkwear, which includes a bias cut slip or teddy, tap pants, and camisole, all perfect foundations for 1920s and ‘30s style clothing. For fabric, I selected our rayon/acetate blend satin faille, which has a great hand and works incredibly well on the bias. I had help fitting the dress pattern from our excellent sewing instructor, Jacque Goldsmith. (side note: Did you know Jacque offers 15 minutes of free advice on the first Thursday of every month? It’s perfect for quickly fitting a muslin!) We moved the french dart up about an inch and added fish-eye darts to the back, to help reduce bulk and better fit my shape. From there, construction of both the dress and slip was straightforward. 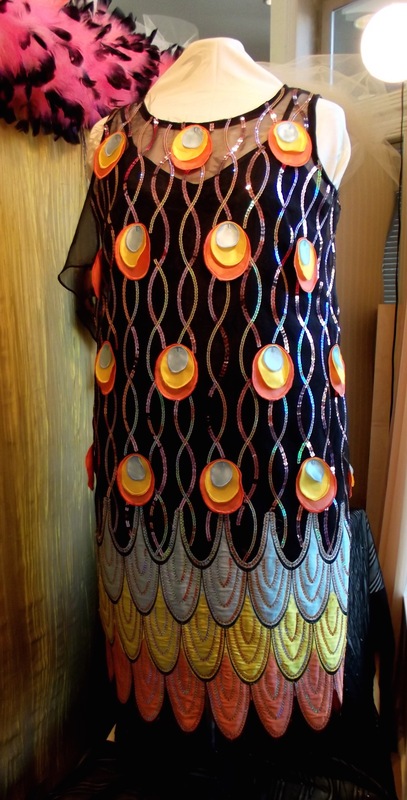 The majority of my efforts were spent removing sequins and appliqués from seam allowances and the darts and hand sewing them back in after the construction was complete. I am so pleased with how this dress turned out! Dress back – I love the elegance and simplicity of the neck scarf. I cleverly hid my back darts under two of the appliqués. 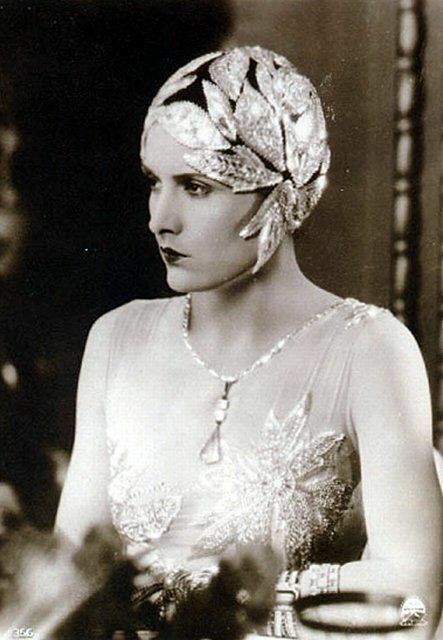 Join me for the next installment as I make a 1920s headpiece to coordinate with my dress! I have a lot more inspiration to share. And stay tuned for the full, final look; it’s the cat’s pyjamas!